Birthday month has come and gone, distanced by weeks and already just a memory. Thirty-one was destined to be my best year yet. 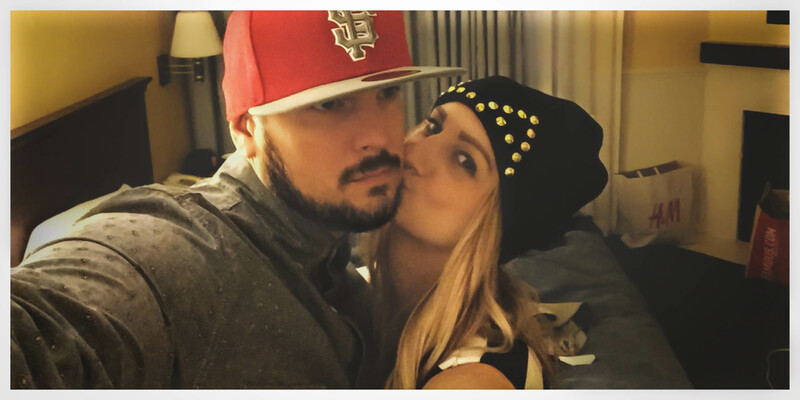 With somewhat of a handle on the adult thing, marriage feeling more like an instinct than an anomaly, careers on track and overall level of life enjoyment at an all time high, thirty-one was promising. Fast forward one year later and I am positive that thirty-two will be even better. Life, the past year, has felt, at best, flawless. Sure, there are goals we have yet to meet in numerous aspects, but the real goal is to always be better than the day before. To reach all our goals in one year would only prove that our bar is set far too low. Life, in all its glory, has been good. We traveled to places we love and places we have never been. 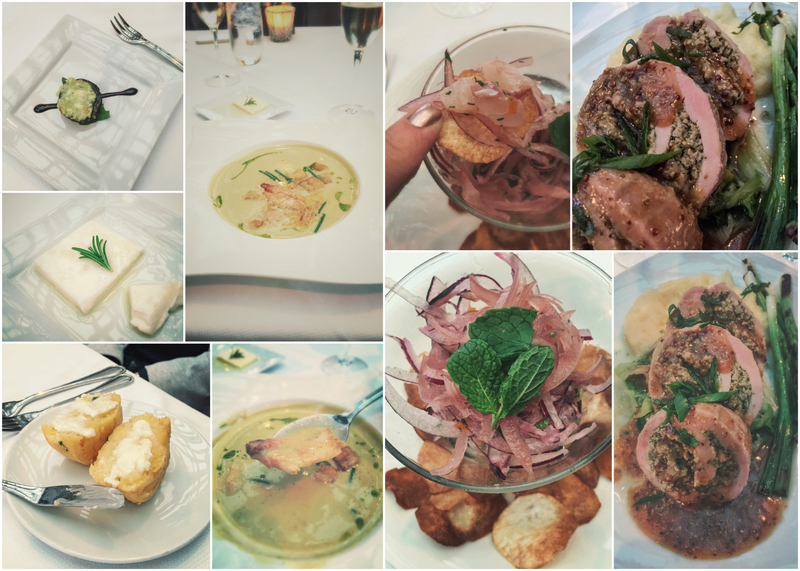 We tasted food that broadened our horizons and raised our standards. We adjusted and readjusted as needed while chapters and doors closed and opened. We loved, lost, climbed, fell, got back up, grew and drained as much humor as possible through all 365 days. It was exactly what I wanted it to be. Recently, I have been spending hours, days and weeks, sorting through the hundreds of pictures from our most recent trip to Gold Country, CA. 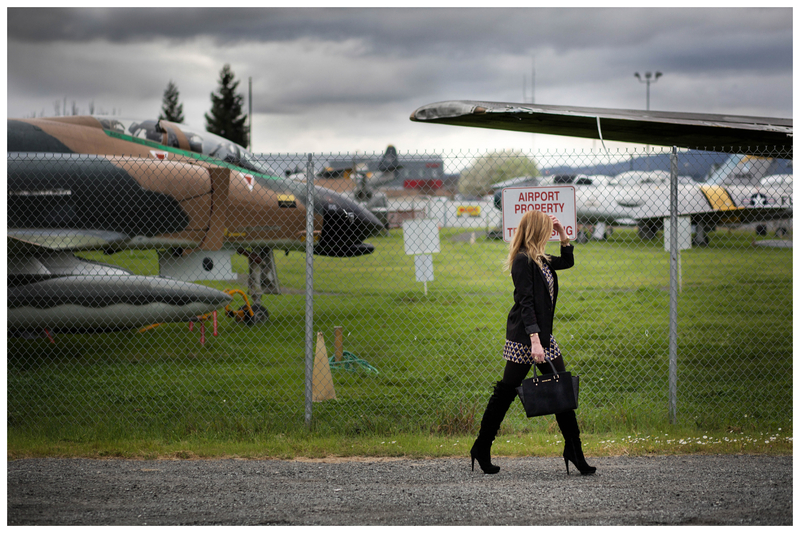 Four days meandering around Jackson, Sutter Creek, Columbia and a handful of microscopic towns, set in the heart of our state’s grand history. The desire for quality during my sorting and editing process has been stressed by my anxiousness to share our experiences. In addition to that, Ryan’s most worshiped sports team, the Golden State Warriors, have made it to the NBA Finals, the first time in forty years. Our home, cat included, has been consumed by all things Dubs related. The balancing act of LA-normal devotion and full NBA absorption brought us to our breaking point last night. Upon discovering our avocados had gone bad and the cutting board I needed was in the wash, we collectively threw in the towel and headed to our number one back-up. Charlie’s, located at the Windsor Golf Course, is the only location we can get to via surface streets on this side of the freeway. 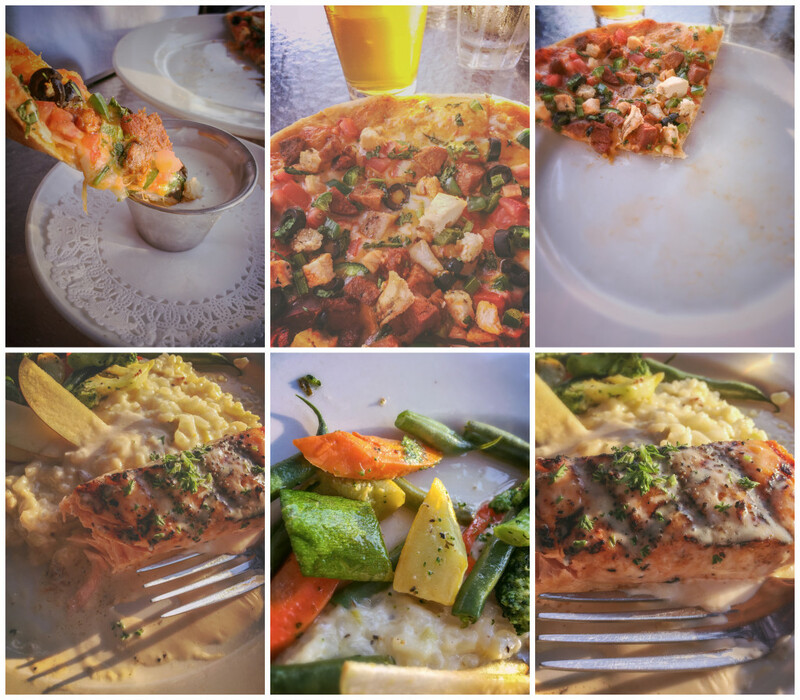 Five minutes away, Charlie’s has always been our secret spot for a quick meal to go or dinner on someones else’s patio where someone else does the dishes. Last night, we opted for the patio, separated from the infinite landscape of lush, green grass, by the pond that marks the tenth hole. Taking consideration of the convenient location, unoffensive view, large menu, full bar, it’s a no-brainer for a front-runner back-up to a last minute home dinner cop-out. To toast our much needed break from our high-strung week, Babe stuck with his number one beer, Racer5, while I stepped out of my comfort zone and tried a random Sauvignon Blanc. It was alright. Before I go into our meal, I have to take a moment to be really honest. Up until the point of ordering beverages I had no thought or interest to cover the evening’s festivities on LA-normal. There was no plan to document and share what began as an ordinary night. 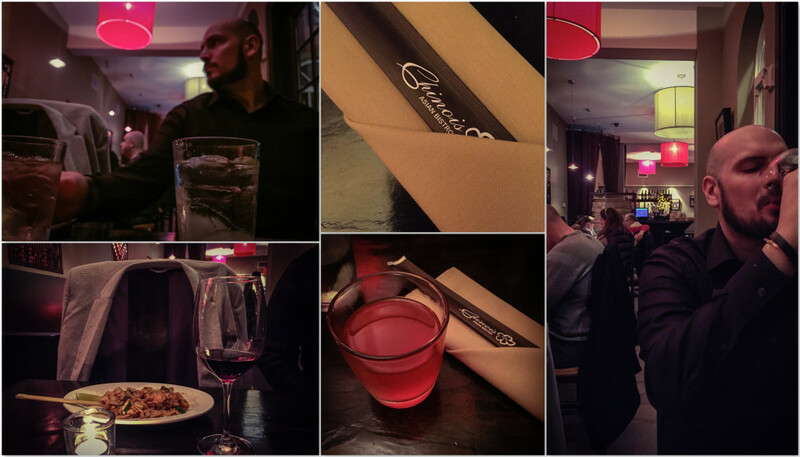 Then, the food came. Should you read this, please make the Mexican Pizza a part of your daily menu. Thank you, Your biggest fan. Adorned in my most recent t-shirt purchase, featuring one of my favorite photographs ever taken by one of my favorite photographers in the whole world, Bob Gruen, and my insanely comfortable moccasin slip ons, I watched the sky prepare for sunset and realized that there was nothing in that moment in time I could ask for from life. I had everything I needed. Except for frozen yogurt, which was close to follow. I don’t believe that we are ever meant to completely understand how all of this works. The ins and outs of the workings of the world, the hidden meanings of every interaction we have, the ideal purpose of our time here on earth. It’s the ongoing lesson that we are assured to learn rather we prepare for it or not. If I had to pick one wish for something I hope to gain in my thirty-second year of life, I would simply wish for more of the same. I just don’t want to go backwards. I don’t want to fall into recession and look back at thirty-one and say man, I wish life was that good again. I think it’s a fair wish, a little safe, but fair. The twenty-four hour breather was well needed. I am more anxious now than before to complete the editing process and boast about our latest adventure. To all of my fellow May babies, here’s to a very happy year ahead. Let’s all work on toning down the crazy and enjoying the moments that come to us, hassle free. With only one full day left of our time by the sea, we had crossed off almost everything on our wish list. Intentionally, the only things left were activities accessible by foot from our front door. The first activity on our list was to roll out of bed and walk across the street to catch the morning sunbathers, floating around Lake El Eserto. Herons, gulls, ducks, geese, mud hens, all call the lakes, barely big enough to be called ponds, home. Surprisingly two of many taking advantage of the park so early in the day, we set up at the end of a mini pier outside of the playground. 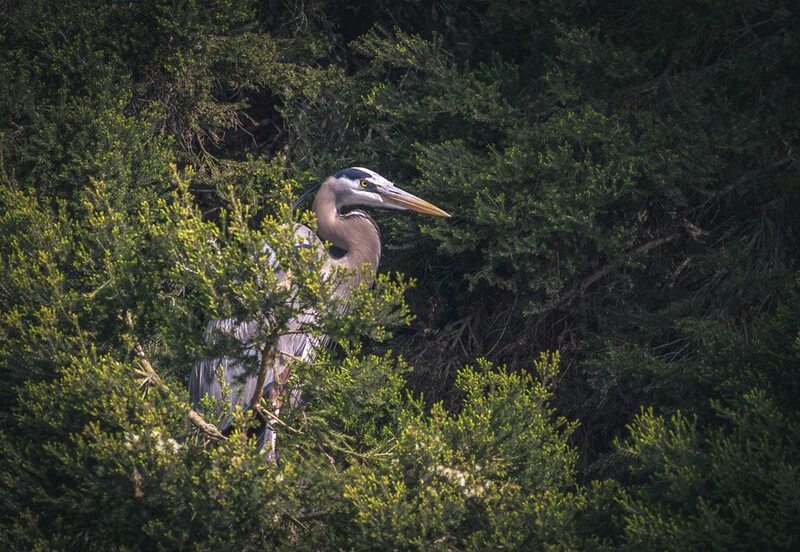 Ryan shot a handful of species including a very dominant resident that we had seen the day before—easily the largest heron he has yet to photograph. El Eserto Park is directly across the street form the Monterey Bay Lodge. It has a fun, easy exercise course, which makes working out during vacation slightly less painful, the Dennis the Menace Playground, named after the beloved character created by Hank Ketcham, a local celebrity, and my favorite thing to watch, swan paddle-boating. There is something about starting your day off by watching smiling, happy families paddle around in ginormous swans, that makes it impossible to not feel pure joy. I saw some really strong sock and sandal combinations that morning. With the feelings of accomplishment sweeping over us, having already been out and about before coffee, we headed back to the hotel by way of a gas station. Beer had been elected for breakfast. Two bottles of breakfast later, with great plans of exploration, we set foot, camera in hand and headed in the direction of Fisherman’s Wharf. The walk from the hotel over to the pier was so short we almost felt ridiculous for never walking it before. It was literally a volleyball court and boatyard away and not only have we always driven there but one time in our life we actually took a taxi. 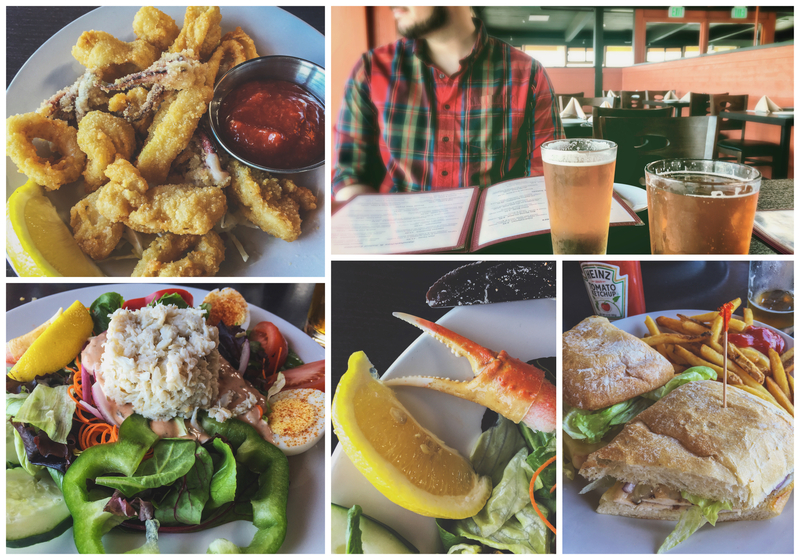 Although the wharf is always a destination for us, usually for a meal or two, never have we taken the time to pass by the harbor. Docked fishing boats, all in rows, most of them vacant, waiting for their next day of work, seemed to have a cast of sadness to me. They looked lonely and bored. Some of them poorly kept and some too clean, like they hadn’t worked a day their whole lives. Thank goodness for the people training their large poodle how to swim to lighten the mood and mask the creeping depression with humor. 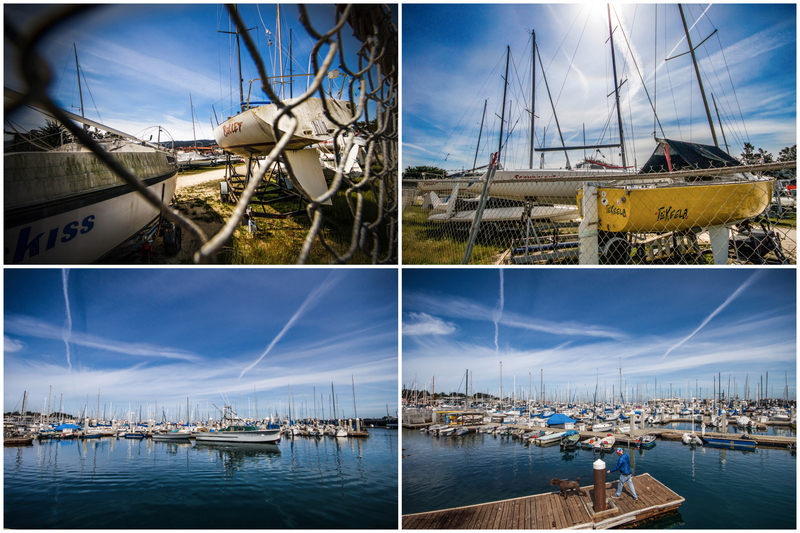 The wharf had all the signs of summer. Warm sun, patrons galore, restaurant attendants trying to lure you in for crab cakes, a man with too many parrots and children everywhere. Working our way through the bustle of people, combined with having nothing but beer in our stomachs, made for two hungry scouts. 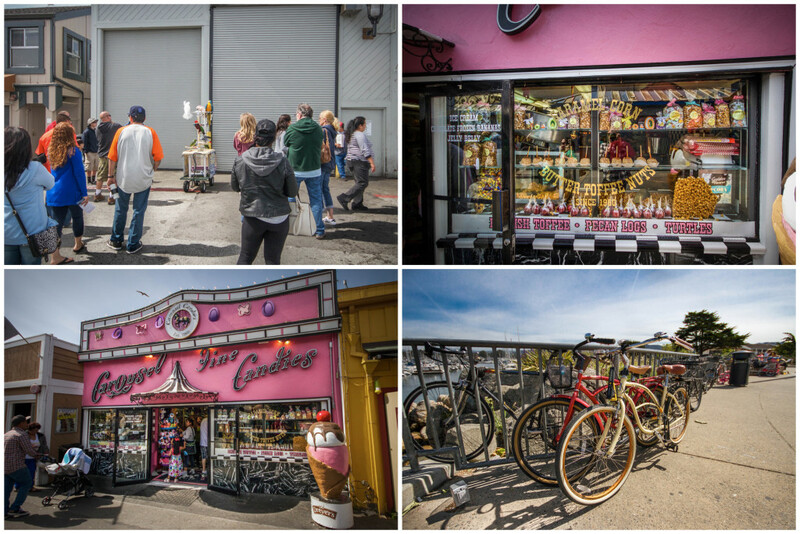 Selecting a restaurant on Fisherman’s Wharf is an art form. You want somewhere that says its well established but not somewhere so old that they stopped caring. You want something that serves seafood but not somewhere that smells like the ocean. Most importantly, you want something that has a view worth staring at but not one where people can be staring right back. 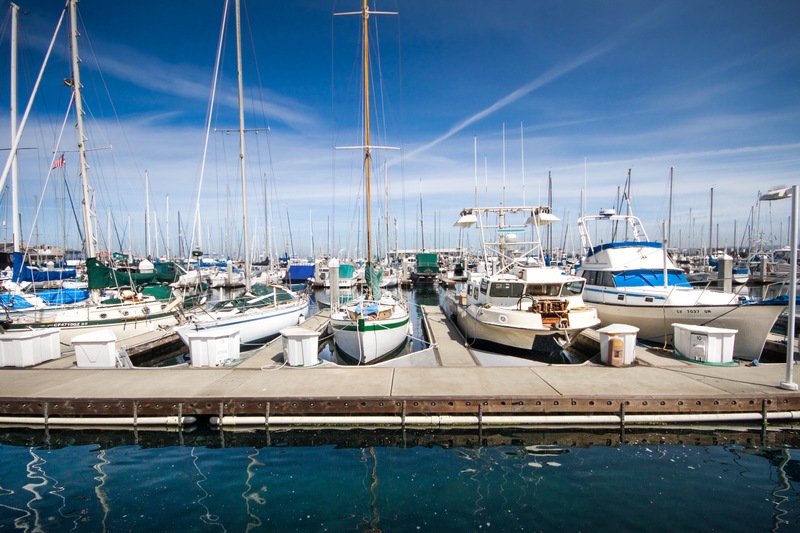 Nino’s Wharfside fit all the right criteria. It wasn’t too new or too old, it had all the seafood staples without the scent and it had upstairs window seating available, allowing us to look out without worrying about someone looking right back. People watching is one of my favorite past times but I like to feel disconnected, observe from afar and not be observed as well. I think that’s formally referred to as a “creeper”. After eating multiple heavy meals in a row since our arrival, I was craving something fresh. We started out with beer and calamari. The calamari was delicious but it only strengthened my craving freshness. I decided to go with the Crab Louie Salad which was clean, cool and crisp. I felt like I could feel enzymes replenishing my body. Babe had a grilled chicken sandwich with french fries, it was exactly what you would expect. He gave it one big thumb up. Served it’s purpose. The best part of Nino’s, I believe, are the views from the upstairs windows. We had the best people watching we have seen in a long time. The star of the show was the small terrier inside of the ticket booth that kept jumping out of the window, causing the ticket seller to come out, grab him and put him back inside the ticket booth, on repeat. I could hear the clown circus music kick on, in my head, every time he jumped out. Co-starring as the second best cast member was the random gentlemen from 1984 in his full black leather suit, complete with loafers and hat. He seemed to be selecting passersby at random and either trying to sell or purchase something from them, unsuccessfully incognito. 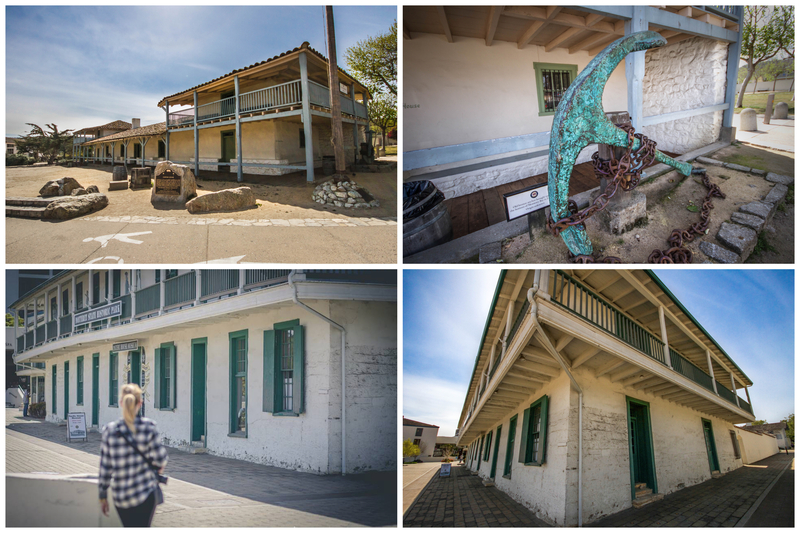 Reenergized and rehydrated, we left Nino’s to complete our self-guided tour. We popped into a couple of classic tourist shops carrying traditional items like sea shell everything and halloween masks… Next we ran into a crowd admiring a gentleman’s traveling, exotic bird collection, on wheels. Sort of felt like we had seen everything after that. Window shopping our way past the sweet shop and exiting the wharf we wondered over to the Monterey State Historic Park. What felt like an abandoned old western movie set with minimal tourist visitors on a Sunday afternoon, was shockingly quiet and peaceful. It would have been a great place for a picnic. After snooping around the courtyard and garden area of the park we walked across the road to Peter B’s Brewpub. Although the bird and butterfly inhabited courtyard was lovely, the sunken outdoor patio area of the brewery, with cushioned bench seats facing a windowed big screen TV, wasn’t a bad runner-up. If it had been just a little bit colder and later in the evening I would have requested our table’s miniature fire pit be turned on. We will be back. Unable to resist the third candy shop we had seen that day, we spent far too much time and little too much money on Zotz, Jelly Beans and Chocolate Rocks. I’m a sucker for a sweet shop. See what I did there? The walk back was shorter than I thought it was going to be. After all those years staying in the same place, in the same room, around the same time, we had no idea so much was so readily available to us without having to drive and deal with parking. To lessen our load that day, we each left the hotel room committed to one camera and one lens. Between Ryan and I, with our different set-ups and different eyes, we walked away from the day with great shots and a huge feeling of accomplishment. It had been a good day and it was going to require an equally great night with minimal movement, my legs were shot. Settling into the room, famished and sore, our next move was obvious, pool party and pasta. With the hot tub all to ourselves we took full-jet advantage and soaked our aching muscles. Reaching the end of our stay, we were content with finishing off the beer and doing absolutely nothing. Grabbing pasta from the Lakeside Grill, the restaurant attached to our lodge, we had our own going-away party for ourselves in the room. Our beer-for-breakfast themed day of photo-walking had made the ideal encore to our vacation and had left us immobile. We pushed every minute of our five days to its max. All of our quests had been conquered and we had discovered numerous new resources for next time. 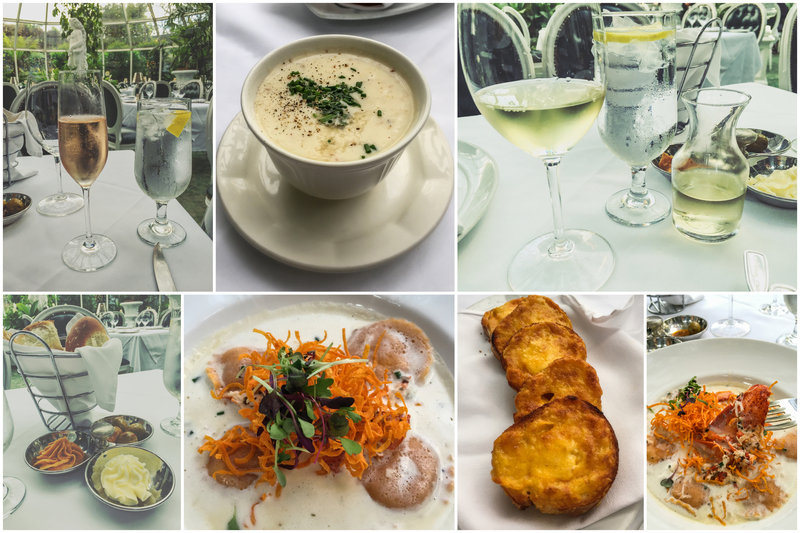 Delicious meals, beautiful ocean views, shopping, relaxing and plenty of photography. Every stay ends up better than the year before. Cheers, to our faithful room 102, we’ll be seeing you around. Typically, I could start this out by saying something along the lines of, “I can’t believe it’s already been a year” or “my how time flies”. Truth is, I completely believe it’s been a year, it almost feels like it’s been longer. There have been an abnormally high amount of changes in our lives this last year, more than most people see in a lifetime. Ryan not only graduated with his master’s but he has changed jobs, twice. The adjustment of him going into his last year as a student, would have been enough. Adding his student schedule into a few lifestyle changes we made (working out more and eating better) on top of just being settled in a new job and then moving twice into new positions made for some trying times. No lessons lost, we have successfully survived and are once again settling into a new normal, if there ever will be such a thing. One thing that remained just as consistent in our relationship as our mutual passion for nachos, has been our love to travel. 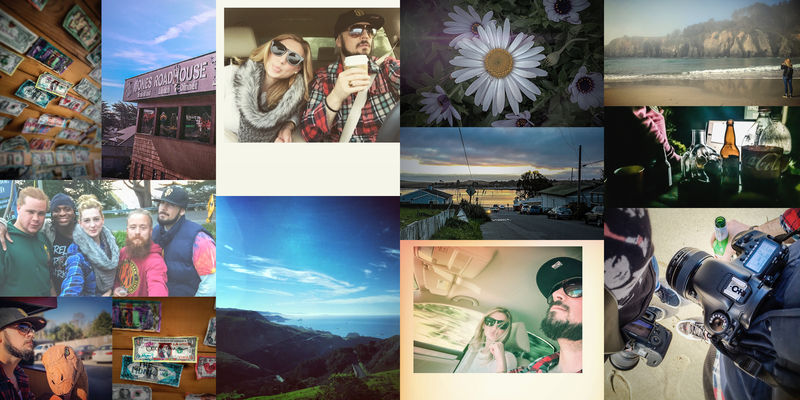 The numerous out of town stays and California road trips have all been our way of rewarding ourselves and maintaining the right balance of work and play. Every step we have taken, photo we have captured, meal we have shared, some documented and some held privately for only us to remember, have all contributed to the best year yet. 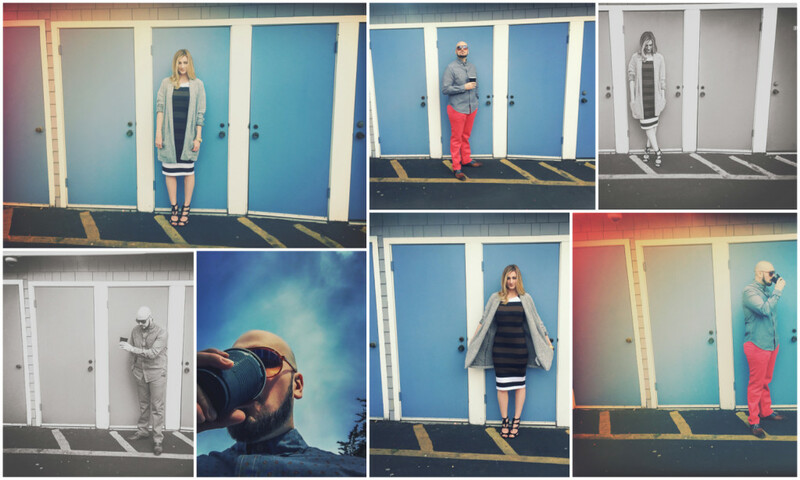 Since I turned thirty-one, we have celebrated almost anything we could use as an excuse to celebrate. We have seen parts of the earth that we never knew existed, in our own backyard. Most importantly, we have created moments and memories so exceptional that some may never be told. As I work on completing the third and final installment of our trip to Monterey, I think about the intention I had a year ago when writing my first post. I was unclear then as to just what my intention really was. I knew I wanted to write because it was my favorite part of school and a part of myself I have missed. I knew I wanted to showcase our photography, have an outlet to feature something we genuinely enjoy doing and constantly grow in. I knew I wanted to talk about local businesses and promote the benefits of supporting local community, wherever that “local” might be. I knew I wanted to be authentic. What I didn’t know was, what is my point? Sometimes I will be in the middle of writing about some meal we loved or a view we shot and I can hear the voice in the back of my head that usually sounds just like my dad saying, but what is the point? For the most part, I still don’t know. What I do know is the process of figuring that out has been one of the healthiest outlets I have ever put into my life. For the first time in my life I have a project that I have total control over and can do whatever I want to with and the freedom has been therapeutic. My gratitude is immense. It is larger than my vocabulary so I struggle with delivering the thanks I feel you deserve. Just know, anytime someone tells me they have read something I have put into the universe, I am humbled. LA-normal started as something for Ryan and I to share that my mom and her immediate group of girlfriends occasionally read. It has become something that has received positive feedback from the most unlikely of sources. To our family, friends, colleagues, local businesses, wineries and even a handful of strangers, I thank you. We thank you. Cheers, to LA-normal turning one. Cheers, to whatever year number two has ahead. Most importantly, cheers, to you! There are places we visit that I find difficult to describe. Places that hold a type of beauty impossible to interpret through story. 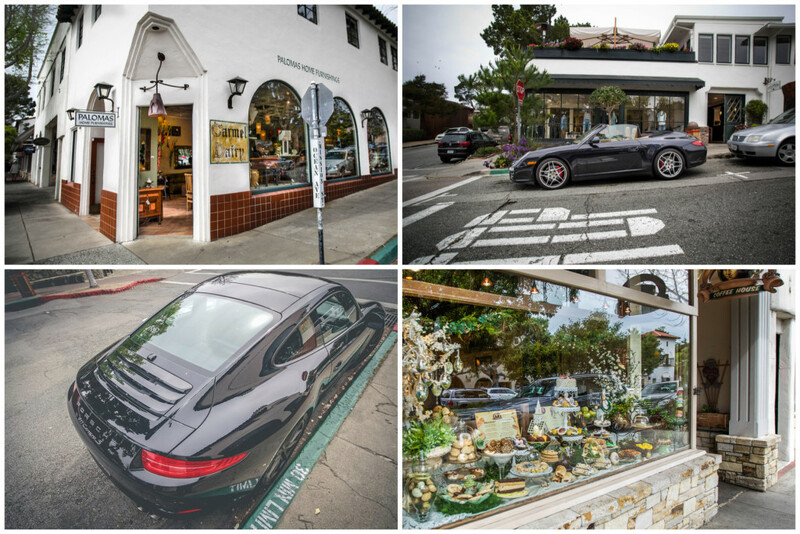 Carmel, however, seems exceptionally easy to describe, given how visually complex it is. 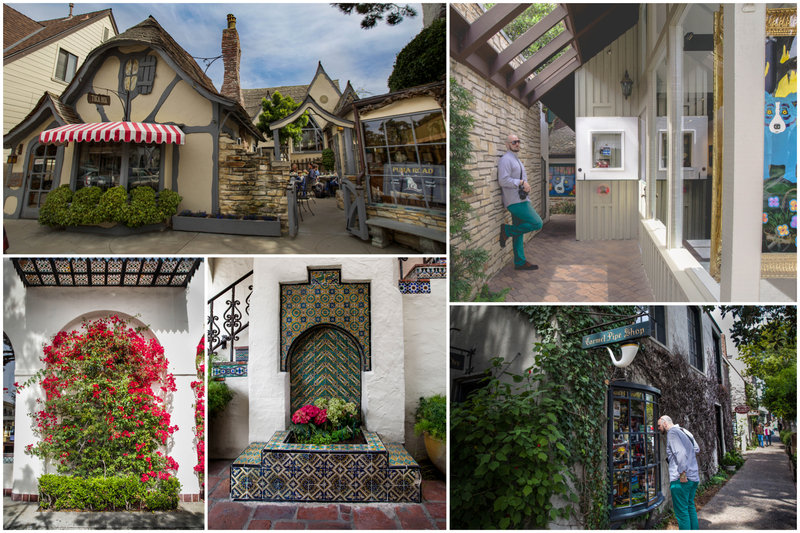 Carmel is high end living in a fairytale setting. 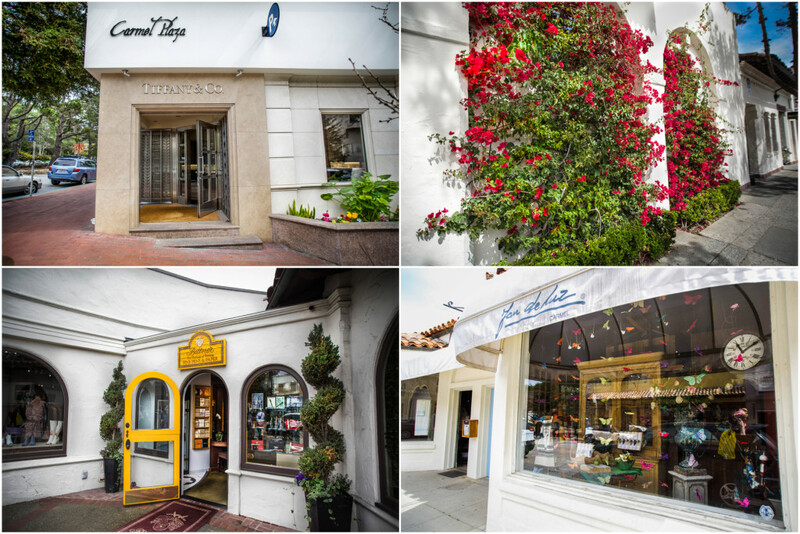 It’s an abundant collection of upscale boutiques, nestled in local restaurants, surrounded by one of a kind homes. The majority of gift shops are nautical and preppy, as are most of the people shopping in them. Wine tasting, breakfast having, seafood dining, all offered by the local restaurants found in downtown. The architecture reads like a village out of a storybook. Layers of ivy and foliage climb the exterior walls of buildings and fences. Cottage like structures with weeping windows and stained glass stack next to brick and stone work. Inlaid tile covers selected portions of store fronts adding an almost conflicting Moroccan taste to the otherwise Cinderella townscape. An occasional super-sleek modern building will stand tall and almost out of place amongst its more rounded neighbors. Colors, iron work, glass, shingles, almost any form or flavor that you can think of is laid out in a package that feels carefully and meticulously drawn together. It’s the equivalent of a hodgepodge quilt created with intention and structure. Our Carmel brunch destination came under high recommendations. 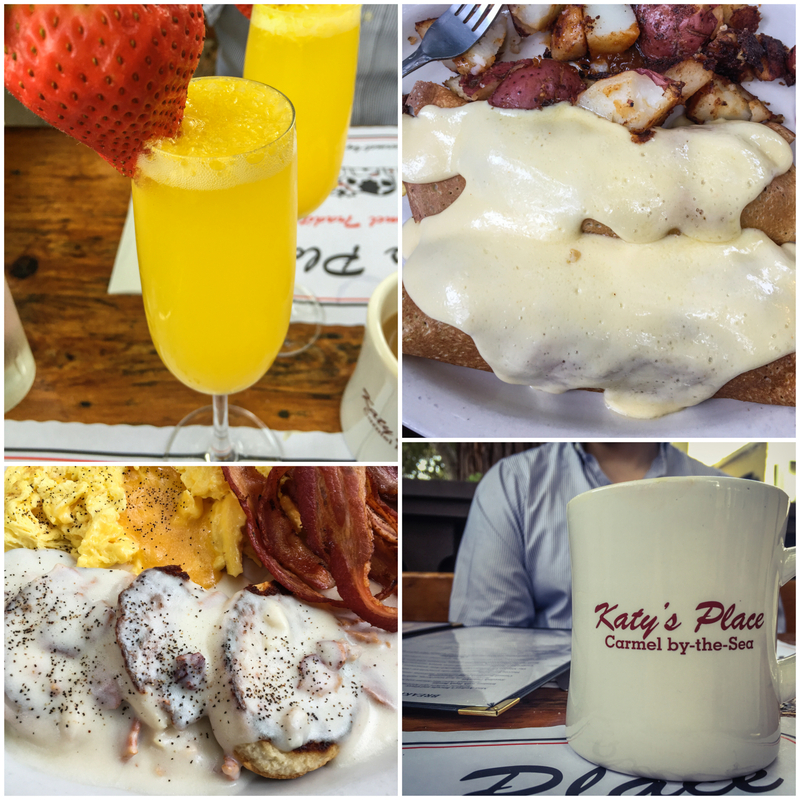 Katy’s Place Carmel is one of the top rated breakfast locations in Carmel on every review website you can Google. Feeling almost like an Elk’s Lodge or Fellowship Hall turned into a single room, smaller than I expected, patio-adorned restaurant, Katy’s Place has everything you can image, from breakfast to burgers. Seated on the outdoor patio, completely enclosed in Carmel’s charm, under the shade of a tree and with the accompaniment of a silk worm on Ryan’s bench seat, we cheered the start of whatever was ahead of us with fresh squeezed orange juice mimosas. I chose the crepe benedict off of the specials menu. The crepes were cooked to perfection and I loved the unique pairing of a classic sweet breakfast dish with the salty heartiness of eggs benedict. Babe, again, had the biscuits and gravy, continuing his private biscuits and gravy comparison investigation for the weekend. He boasted over the fresh, house-made bacon and flavorful gravy the rest of the day. Two bites shy of being overly full, we set foot to pavement and started our window shopping photo walk, with occasional boutique pop-in. We had assigned ourselves three tasks to complete as we strolled amongst the polo shirt and khaki wearing patrons. First was a stop in our favorite Carmel-by-the-Sea shop to peruse in, Boatworks, always full of things we dream of owning one day when we have more space, like old boat propellers and ship models. Second was a stop into Laub’s Country Store to pick-up something for the niece. A pink and tan baseball cap with a happy whale embroidered on the front really spoke to us. Third, locate and purchase from the local cigar shop, Carmel Pipe Shop, to pursue our possible new hobby. In a solid two-hour walk, we nailed each assignment with flying colors. I became obsessed with all the different doors Carmel-by-the-Sea had. No two doors were alike. 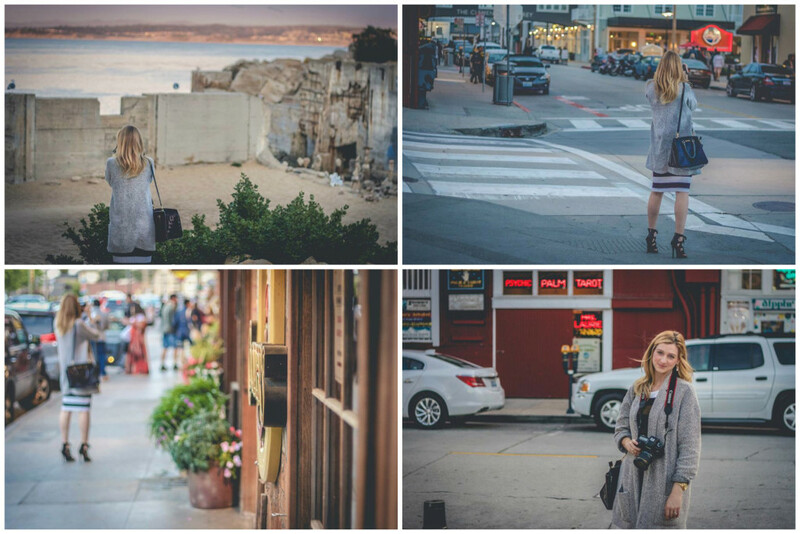 With photography as our primary intention for the entire day, we headed down to Cannery Row for dinner and an evening of walking around. The evening’s kickoff will go down in history as one of the most memorable meals we will ever share. 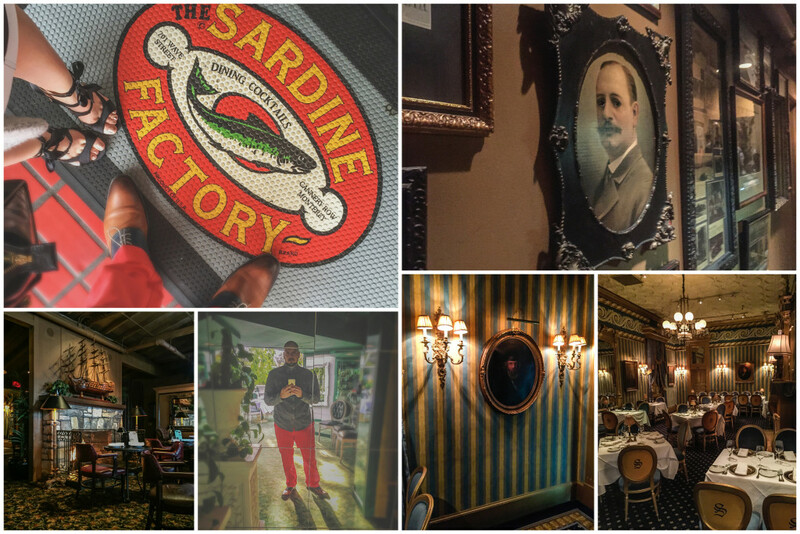 Knowing our mutual passion for anything historically famous, Ryan booked us dinner at the one and only Sardine Factory. 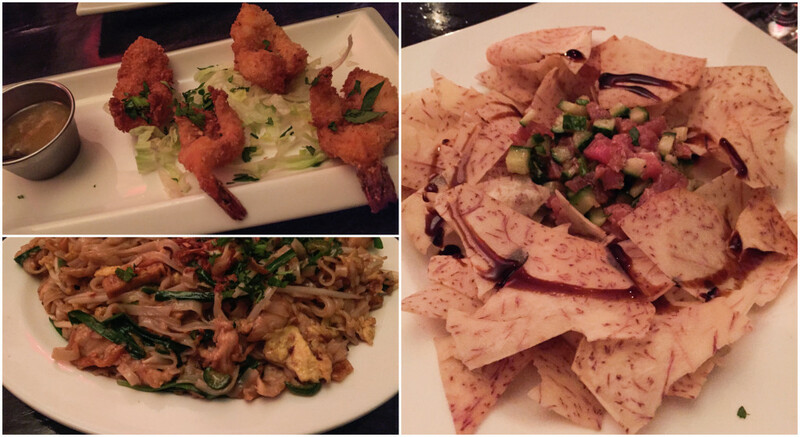 After a failed attempt to get reservations there two years back, this meal was drastically overdue. Arriving a few minutes too early, we were met with a wait in the front of the house where both the bar and lounge seating area resides. The decor makes you feel like you are in a well preserved gentlemen’s lounge from the 1970s. Built in 1968 the best way to describe the significance of The Sardine Factory is to quote them straight off their website’s homepage. After our brief wait we were led to our table, passing through a room reminiscent of a victorian ballroom and down a hallway that I swear had a painting of a man missing his eyes. It felt as if the lighting was becoming dimmer with each step we took, further and further from the front lounge, until all of a sudden we reached a completely mirrored entry way and came into a burst of light and life. Our dinner for two was specifically reserved, by request of my husband who always does his homework, in the Atrium Room. 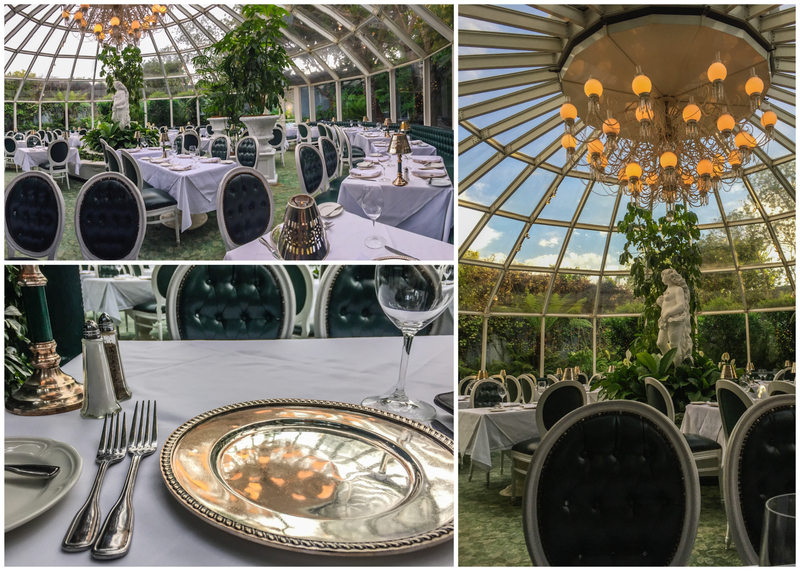 The completely windowed, dome-shaped, chandelier-adorned, dining room has a 360 degree view of live greenery and pure blue sky. I immediately felt like Michelle Pfiefer in Scarface and wished I had picked something disco chic for the evening instead of my modern pencil dress. I felt as if I would never be fully happy eating in any other setting for the rest of my life. The menu, prepared by award-wining chefs, features seafood classics and USDA prime beef selections. Predictably, we started with the Factory Cheese Bread and a cup of their World Famous Abalone Bisque, notoriously served at “Taste of America” for former President Ronald Reagan’s Inauguration. I mean, how could we not, right? Shockingly smooth, the bacon, chive and abalone pieces were exceptionally fine and added tremendous flavor to the creamy, wine based bisque. Selecting our main entrees turned out to be the toughest decision of the day. After practically memorizing every option, we both landed on the Lobster Raviolis, I with a half order and Ryan with a full. The lobster stuffed pasta with truffle cream sauce was presented beautifully. I do not know how to explain how delicious those little pillows of goodness were but I will say this, that ravioli was so good that for an extended period of time I thought I was freaking out. It was the first time I have ever eaten something so good it almost sent me into a full blown panic attack. With no room left for dessert, as usual, we sat back and finished our wine and soaked up every last millisecond we could of our surroundings. Should you ever find yourself presented with the same opportunity we had that evening, to reserve a table in the atrium, I highly suggest you book it as early in the afternoon as possible. We made our reservations for 5:00, the time they open, and it gave us the entire dining room all to ourselves for a solid 30 minutes. Just us, our 2 waiters, and the Greek Goddess centered under 1 hell of a lighting piece. I am usually not one to end a romantic meal with pictures of a bathroom, however, when the bathroom is wall to wall, floor to ceiling mirror with elaborate, carved, solid gold trim outlining everything from mirrors to bathroom stalls, complete with fresh roses draping the vanity, it is virtually impossible to not consider it quite the grand finale. Post-dinner festivities included a long walk along both sides of Cannery Row while sunset changed the sky from all shades of sherbet to bright royal blue. Although we have walked the same sidewalks numerous times before, when you have your camera in hand you suddenly see familiar areas with brand new eyes. I had never paid much attention to the way the end of the row begins to break away into prehistoric beachfront, in and out of the ticky-tacky painted boxes that host most of the souvenir shops. We avoided shopping, other than a swing through the sweet shop. Cookie assortment for him, frosting covered angel food with sprinkles for her. Thank you. Nothing does a pair of feet that just spent most of the day walking, fifty percent in stilettos, better than a soak in a hot tub. Without any explanation, we can’t figure it out ourselves, the pool and hot tub at the Monterey Bay Lodge is the only other pool and hot tub we ever use besides anywhere in Vegas. We just do not use hotel pools, not even when we stay at The Roosevelt in super hot Los Angeles, poolside. Something about the heated pool and generically simple hotel hot tub, just outside our sliding door, blocks away from the ocean shore, leads us to temptation every time. This time was no different. Soaking, relaxing, showering and angel food frosting-ing sent us to bed with literal visions of sugar plums. We were going to need all the solid sleep we could get. Next up was a full day of investigating anything we could reach by foot from our front doorstep. The month of March holds an abundant supply of important events, more than I often give it credit for. 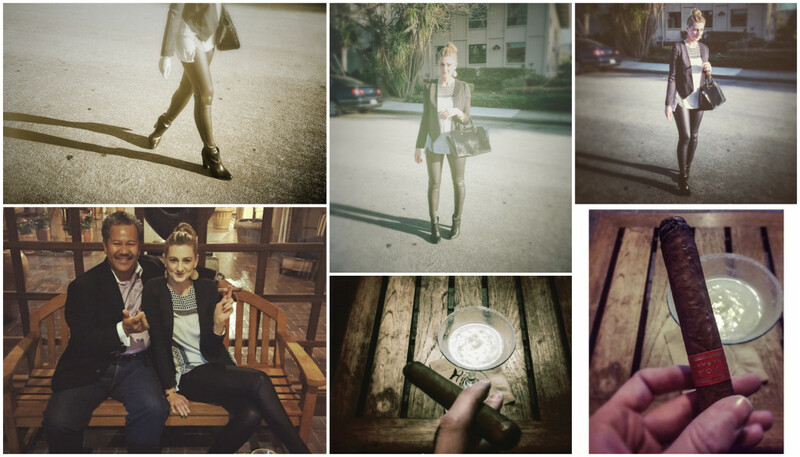 March is the beginning of spring which means wardrobe revamping and beautiful evolving landscapes. 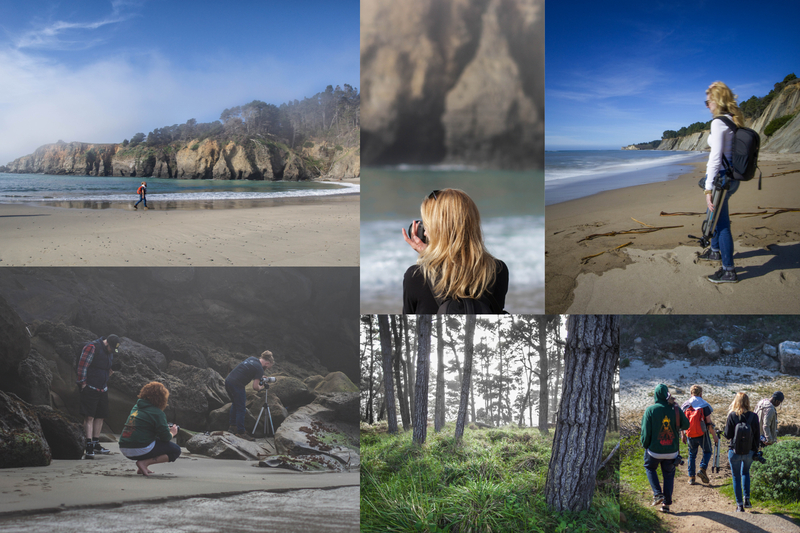 It’s a dream season for photographers looking to catch life in it’s fullest bloom. New life is everywhere. Some very important people in my life have birthdays in March, making it full of celebration. St. Patrick’s day lives in March, a beer drinkers favorite. Most recently, it has become the month in which we take our annual vacation to Monterey. Ryan and I discovered a mutual love for Monterey from the beginning of our beginning. 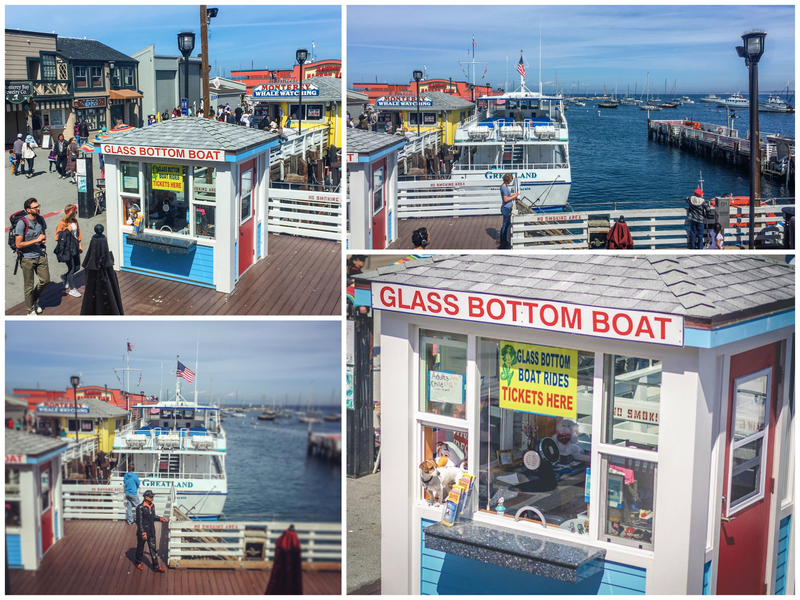 Not only did we both have fond childhood memories of visiting the aquarium and fisherman’s wharf, but it was one of the first places we vacationed to as a couple. Our first trip was too short, just a weekend. So, we dedicated ourselves to going back annually, for no less than five days. The five day rule. In keeping our word, this year marked trip number four. 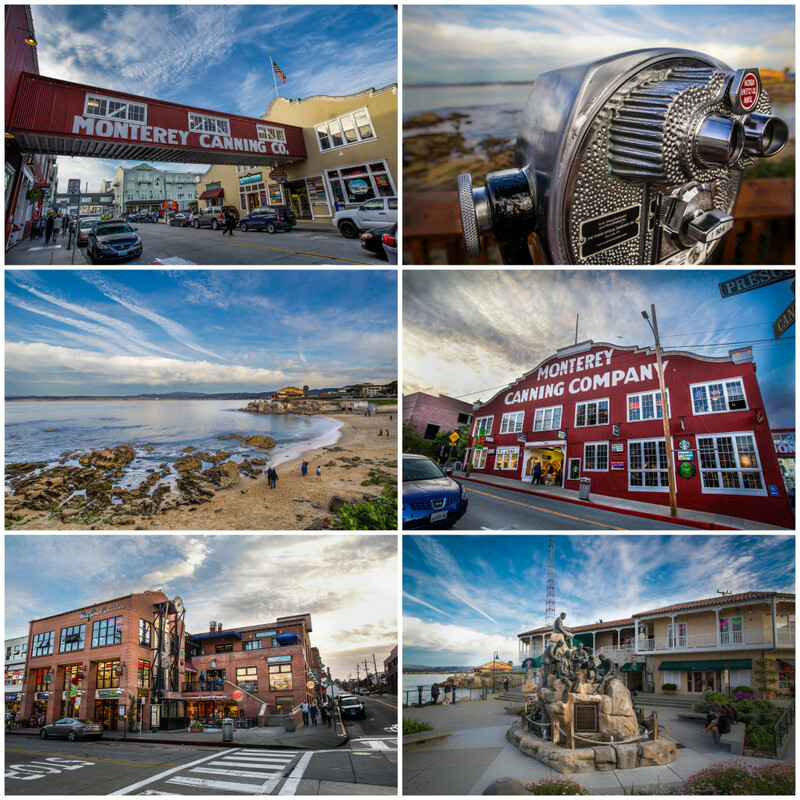 Located on California’s central coast, Monterey, has everything we look for in a vacation spot. 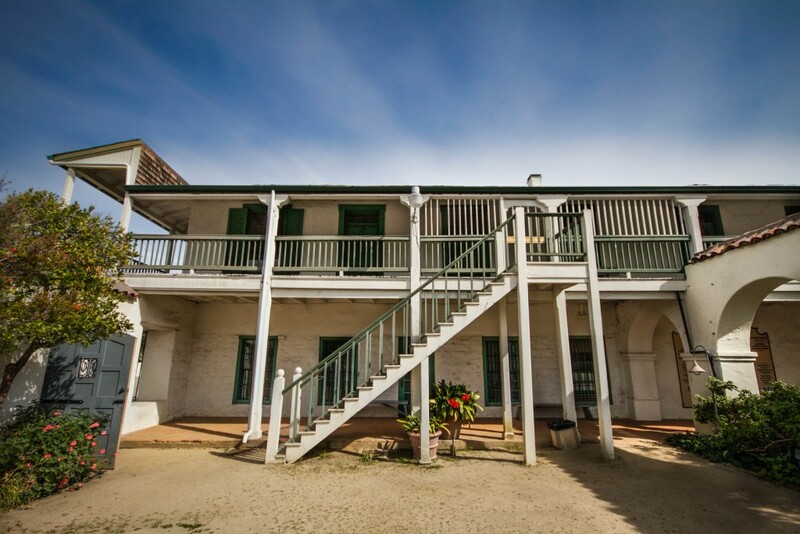 Historic landmarks, hiking trails, tourist attractions, endless local restaurants and great shopping. Not to mention, it’s coastal. The only problem we ever have during those five days, besides finding someone to check on the cat, is carefully selecting how to distribute our time. With the amount of things we like to do there, it is impossible to cover them all during one stay. Two years ago, we spent a day in Pebble Beach and took a very leisure cruise along 17 Mile Drive. We took in the grandness of the homes lining the Pebble Beach Golf Course and spent a good amount of time photographing the Lone Cypress. 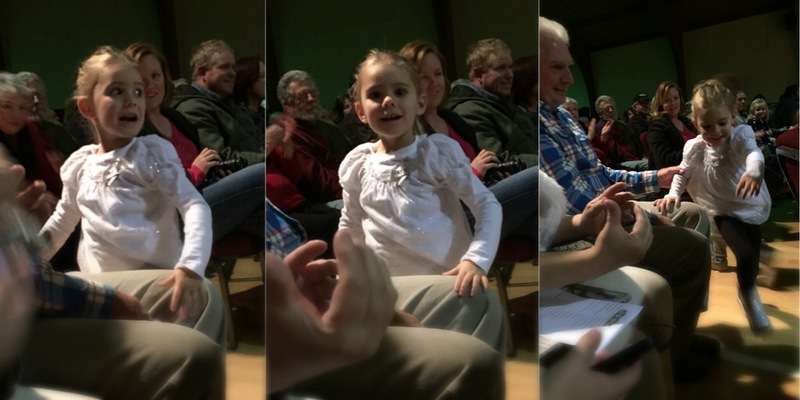 Last year, we went with Ryan’s family, including our three year old niece. We took the munchkin to Monterey Bay Aquarium and shopped along Cannery Row. As much as I love the aquarium, it’s not something that I need to do every year. This year we had two locations we were adamant about seeing. Carmel, a place we had been to before and were dying to revisit, and Point Lobos, a place we had never been to but were also dying to visit. Just like always, we pulled up to our humble room, 102 of the Monterey Bay Lodge, complete with fireplace and direct pool access. We always reserve room 102. We in fact acquire room 102 so regularly that it’s registered to my phone number at the local pizza joint, Pizza My Heart. The guy that takes our order finds this extra amusing, every time. Upon arrival, we are always overly anxious to drop off everything and head out. 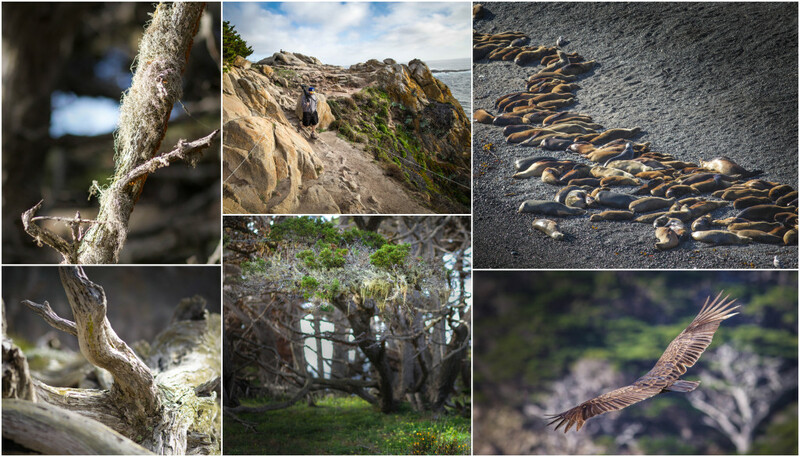 This year was no different and as fast as we could check-in we were back in the car, headed to Point Lobos. 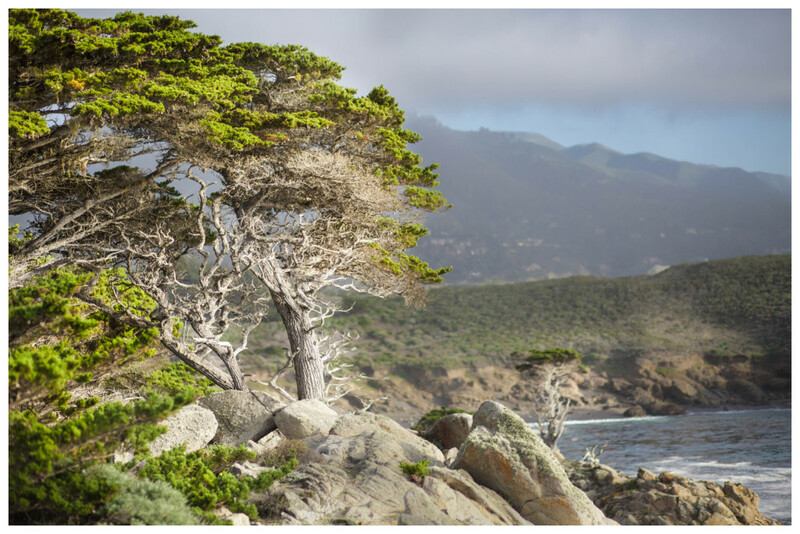 Point Lobos State Reserve has a plethora of trail options. From our parking location we had two trails we knew we wanted to cover before sunset. Both were relatively short walks, ideal for lugging tripod and camera bags. Like most trails we select, they were precariously carved along the rocky, cliff framed coastline, giving my stomach that “Tahoe gondola” feeling. First, we traveled south, following signs for Seal Cove. Not too far into our walk we reached the viewing platform (I use the term loosely), of a small niche, far below, lined with sea lions. Watching the piles of seals was slow motion entertainment. The massive animals seemed extra lethargic and did little but shift themselves in the dog-pile conga line they formed along the shore. Other than an occasional new member to the group waddling out of the water, or an alpha male barking his call, there was little to no movement and yet I could have watched them for hours. The designated viewing area for the seals was high above where the former pathways had been roped off. Looking down into the cove made it easy to forget how high up and eye level we were to other life that inhabits the area. A close encounter with a turkey vulture was a great reminder of our geographic location. After being close enough to feel the gusts of wind from it’s wings and then recovering from being startled, all I was able to catch was the buzzard’s back. It was good enough to cement the memory. We were fortunate that the difficulty level of the trails was at an all-time low because our inability to stay focused was at an all-time high. Our second trail led us north, in and out of the most vertically challenged forest of trees I have ever seen. I couldn’t stop looking at everything. With my eyes darting everywhere but straight ahead of me, I had a few run ins with diagonal trunks, leaning over the trail. At one point I considered myself “tree birthed” as I had to pass through a split tree to stay on course. With the sunset looking dismal and a Warriors game approaching, we shot some final landscapes and headed back to our home away from home. After pizza and basketball, day one was in the books. It felt great to be back. 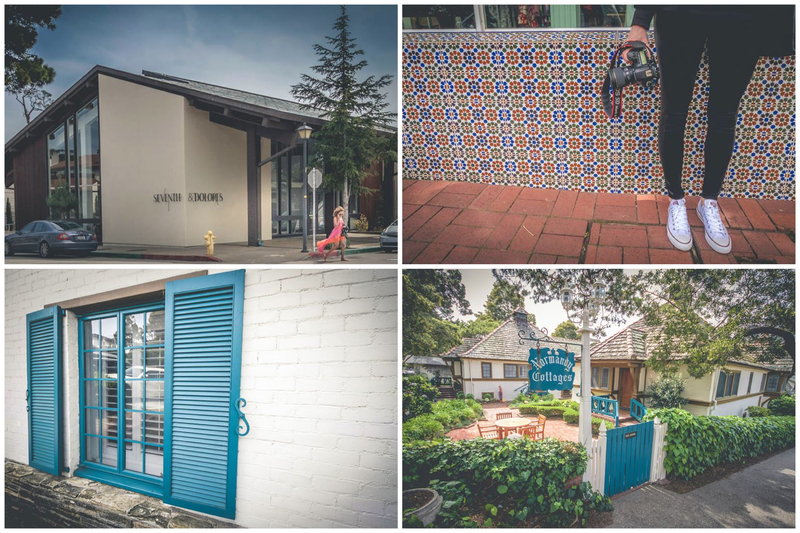 Originally, day two’s schedule involved brunch and an extensive photo walk in Carmel. However, being who we are, in general, as people, we bumped Carmel down a day and shopping up one. Day two started strong at the lesser-known Monterey outlets, American Tin Cannery. Unable to shop on an empty stomach, we had brunch at First Awakenings, a popular indoor-outdoor breakfast spot with a diner style menu. Babe had biscuits and gravy–super yum. I had the Acapulco Express omelette–delicious. We probably should have stopped there, both servings were unknowingly more than we could eat but that darn chocolate-chip banana pancake special on the white board by the front door was too intriguing. When the waitress brought out the worlds largest pancake, I knew we had made a mistake, the best tasting, fluffiest, warmest, sweetest mistake ever. Totally worth it. The outlets are minimal and usually close to empty, especially on a weekday. There are only a handful of stores and most of them are shoe-based, no complaints there. We both always manage to find the most random stuff on great sale. They’re sort of our secret source for things we know not many other people will have, at prices not many people can beat. And for anything we can’t find at the outlets, we head over to the Del Monte Shopping Center. I’m a sucker for a well landscaped, well maintained, ocean aired, outdoor shopping center. To end a successful day in the most appropriate way, we taxi’d down to the hub of Monterey tourism, for dinner with a very special local. When we originally told Mr. Tony Moises, a dear friend and our wedding officiant, we felt like steak we had no idea he would take us to possibly the best steak dinner I have ever had. Adorning some new finds from the days shopping extravaganza, we met Tony at the The Whaling Station Steakhouse, just one block up from Cannery Row. The menu was pretty classic steakhouse, twice-baked potatoes, creamed spinach, onion rings, but the steaks were what truly set it a part from any other place I have encountered, except for maybe one place in Chicago, but that’s irrelevant for the time being. Just keeping myself honest. When the waiter presented the steak selections for the night to our table, raw, plastic wrapped, on a silver platter, and then proceeded to explain in great detail the variations of cuts, I knew we had been taken somewhere like nowhere we had been before. I chose the petit filet mignon that was served alongside mashed potatoes and spinach. I happily cleaned my plate and then proceeded to split the creme brûlée with the husband, who was also overly pleased with his meal. Feeling incredibly spoiled and on the verge of never wanting to leave, the after-dinner ending of the night proved to be the highlight of our entire trip. After years of watching Mr. Moises enjoy evening cigars on my parents’ front porch, back porch, a couple of hotel courtyards and various other cigar friendly locations, it was time for a lesson from the master. Ryan had made an executive decision that during this visit to Monterey not only were we going to have dinner with Tony but we were going to partake in Cigar 101. There, on the patio of the Portola Hotel & Spa, with the most incredible coconut lemon drop in hand, I listened intently to the fundamentals and miraculously took very naturally to my first attempt at cigar smoking. I will say, not as bad as I thought it would be. I will also say, the thorough lesson from Tony was informative, entertaining and a moment that Ryan and I will remember for the rest of our lives. Thank you, Tony. I am not sure if you have “created a monster” yet but you absolutely receive an eternal “cheers” for being such a perfect instructor and host. 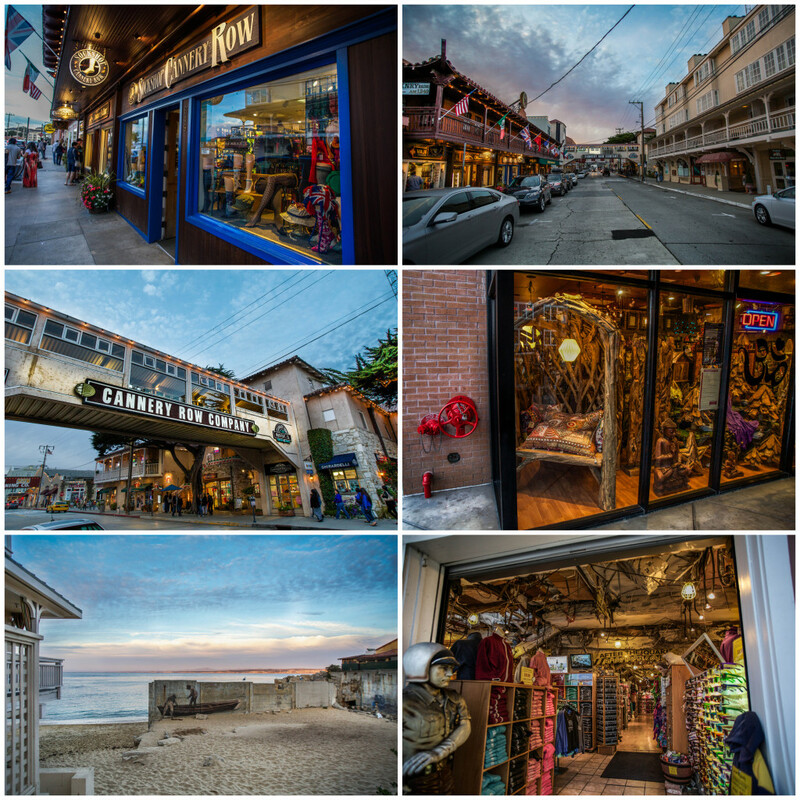 With a long day of Carmel-perusing and Cannery Row photo-walking ahead, we did our best to be in bed before midnight. Shopping, dining and cigar smoking can be exhausting and we still had half of our trip left to conquer. Since being back in Northern California, Sonoma County and I have endured quite a bit of reconnecting. The amount of change that the county experienced in just under a decade made coming back feel like a move to a foreign land as opposed to a return to familiar territory. Whenever I move to a new place I start a courtship, get to know the surroundings, figure out what I like and don’t like. We date. Sometimes it’s an instant connection (Los Angeles) and sometimes it never takes (Orange County). Moving back up above the bay, the reunion was reminiscent of high school sweethearts, reconnected after years of individual growth. Being freshly twenty-one when I left, I missed out on many of the amenities that Sonoma County offers. 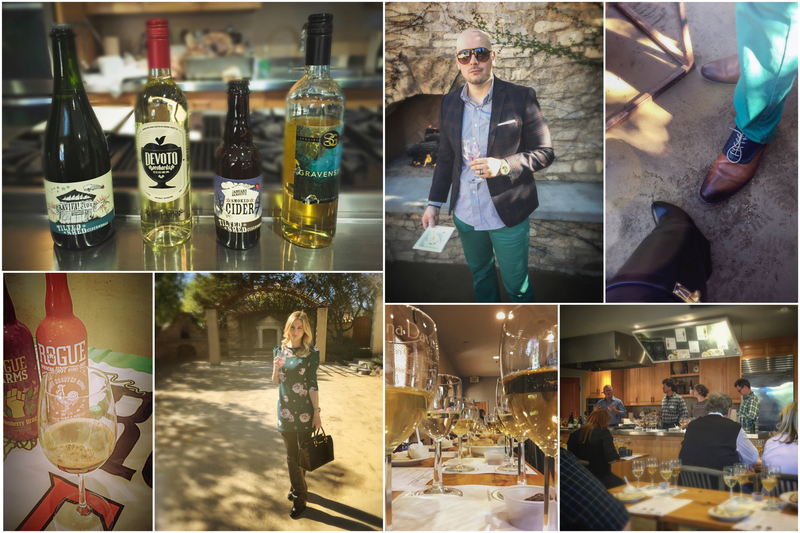 The wine tasting, brewery visiting and accessibility to every cuisine you can imagine has made this reconnection extremely successful. 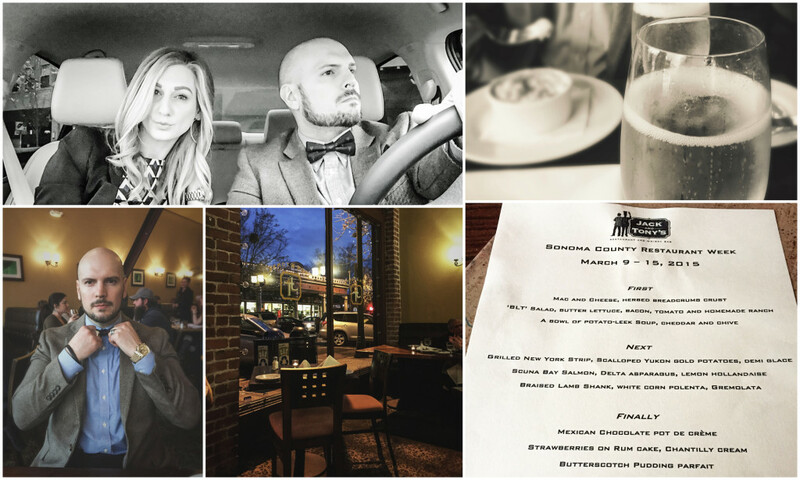 One of my favorite forms of courtship that I have experienced in Sonoma County is Restaurant Week. Endless restaurant options from all around the county makes becoming overwhelmed very easy. For a patron, Sonoma County Restaurant Week is a solid seven day block where participating locations create set menus that fall under 1 of 3 price categories depending on the level of fine dining. It is a great opportunity to explore new places that may normally be unattainable for your budget and revisit some of your favorites just to try the featured dishes. For the local businesses, Restaurant Week is an opportunity to attract new business and cater to a fresh audience. 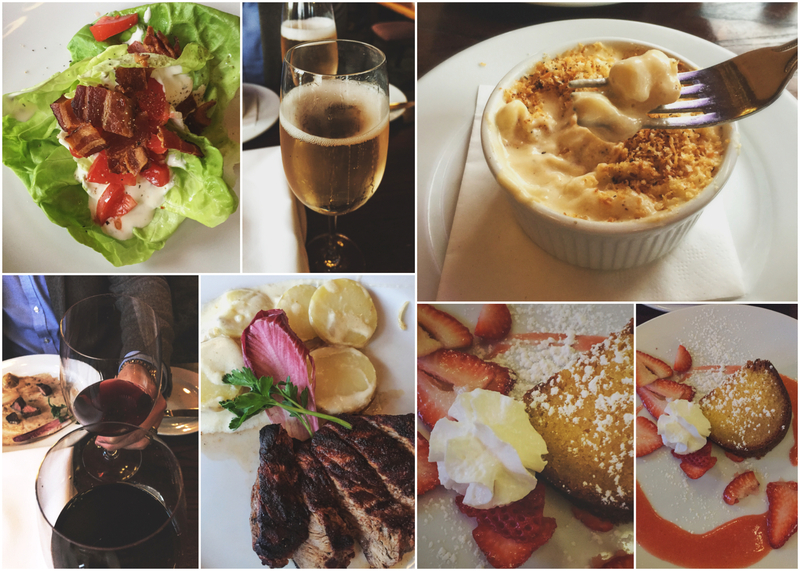 Each year we traditionally start our week out at John Ash & Co., a $39 per person menu option. This year was undoubtedly my favorite menu yet. 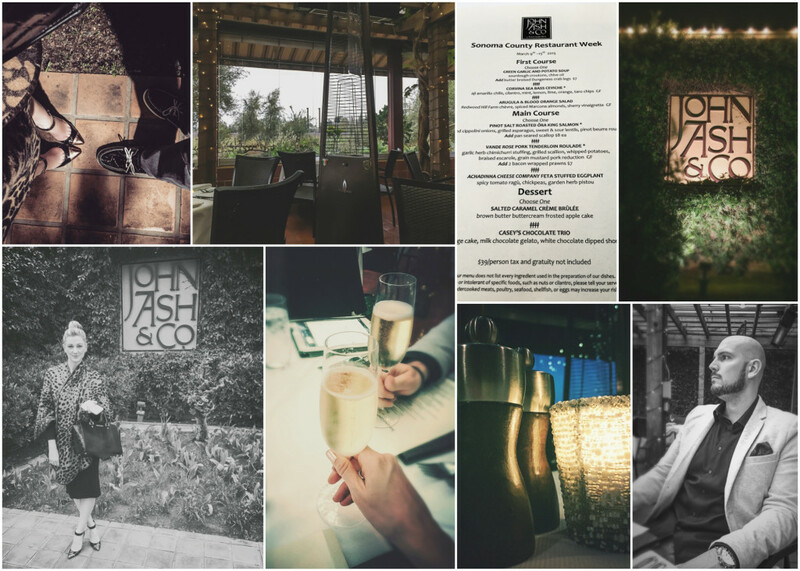 A convenient exit away from our home and undeniably one of the best restaurants in the entire county, John Ash & Co. at Vintners Inn is the epitome of “wine country dining”, with an outdoor patio surrounded by vineyards and a menu designed specifically for wine pairing. This year’s menu offered plates so meticulously created that decision making required a toast of champagne. Sadly, one of everything was not an option, so Ryan and I made our selections in an attempt to taste as much of the menu as possible. After our stuffed mushroom amuse bouche, Ryan selected the Green Garlic and Potato Soup with braised Dungeness crab legs for his first course, I, the Corvina Sea Bass Ceviche. The soup would have been delicious as a stand alone but the addition of the crab legs gave it just the right balance of meat and texture to break up its creaminess. My sea bass ceviche was incredible. With fresh mint and three times the citrus it was the perfect motivating precursor for springtime. For our second course we were unable to compromise on opposing selections and both ordered the Vande Rose Pork Tenderloin Roulade. The pork was perfectly prepared and came with my favorite side dish, whipped potatoes. The mustard reduction, topping the pork, was so good I would eat it as a soup. In traditional “wine country dining” fashion, we each selected what we felt would be complimentary reds. Babe went with Walt “La Brisa” Pinot Noir and I had Valdez “St. Peters Church Vineyard” Zinfandel, both paired well.The dessert course was a no brainer. Creme brûlée is by far one of my top three favorite desserts in the entire world so the Salted Caramel Creme Brûlée was an obvious pick. Ryan loves anything chocolate so Casey’s Chocolate Trio that featured chocolate in the form of ridge cake, gelato and dipped shortbread, was his immediate choice. We shared as much as we could bare. The milk chocolate gelato from Ryan’s plate was my favorite out of everything. 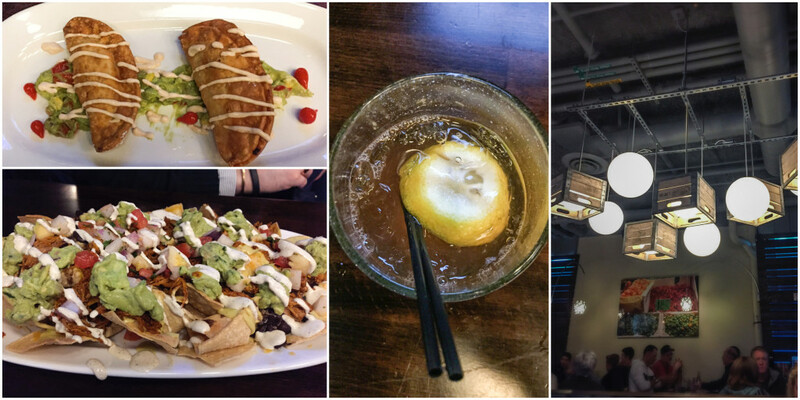 Curious of what a $29 menu entailed, the second featured location of our week was Jack & Tony’s Restaurant and Whisky Bar in downtown Santa Rosa. Just previously eating there for a company party, I was anxious to sit and relax in a setting that I remembered being a little more swanky and a little less formal. With feelings of a gentlemen’s lounge and offering the best beverage selections I have found locally, Jack & Tony’s proved to be a great source for meat and potatoes. The menu offered only my favorite foods on the planet. Ryan’s first course was the Mac and Cheese while I opted for the ‘BLT’ Salad with homemade ranch dressing. I was impressed that Ryan was willing to give up some bites of the super creamy Mac and Cheese. A great Mac and Cheese is always hard to share. My salad tasted just as good as it looked. You can never go wrong with bacon. The second course was an easy selection for us both. Grilled New York Strip with Scalloped Yukon Gold Potatoes hit all the right spots. Intentionally setting out that evening in hopes of scoring a great steak and potato, we nailed it with the assistance of Jack & Tony’s. Despite being served our first course before receiving our champagne and feeling slightly embarrassed to order my steak well done based on the clarification requested by the waitress, all possible room for ill will was shut out once dessert was served. Strawberries on Rum Cake with Chantilly Cream could be my new weak spot. I could barely handle the greatness of the rum cake mixed with the sweetness of the berries. Half of me couldn’t stop eating and the other half wanted to take all the time in the world to savor every bite. Where’s the fun in leaving the house for a meal if you can’t spend a little bit of time in the closet before hand? In the spirit of the great deals that Restaurant Week offers, I intentionally picked pieces from my humble collection that were darn-good great deals themselves. For our evening at John Ash & Co., I finally wore a pair of BCBG stilettos found on clearance at DSW (the happiest place on earth) for a mere $12.99. A savings so enormous I was practically being paid to purchase them. 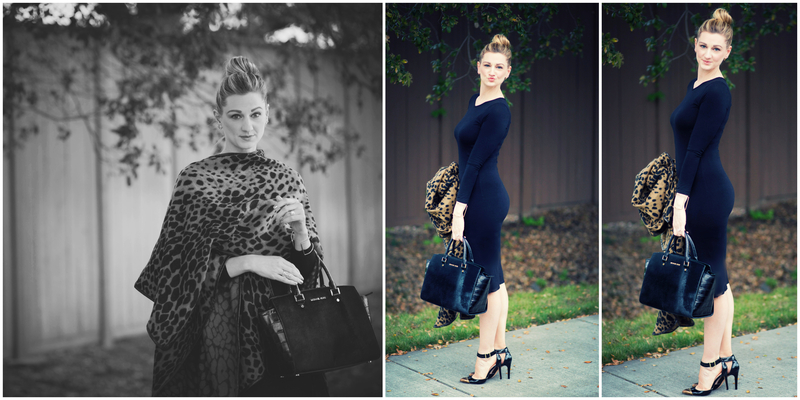 In a last minute grab out the door, upon discovery of the chill that was rolling in, I draped on my Anne Taylor leopard cape, found during a seasonal switch over clearance for $17.00. The subtle feeling of success after stumbling upon crazy-good sales is a serious addiction. For Jack & Tony’s, I pulled literally the least expensive dress I have ever owned. During a brief stop for a picture frame at Marshall’s, I somehow ended up on a detour through the dress rack. Shopping in places like Marshall’s is often too intimidating for me to do on my own. The feeling of competition against thy neighbor and urgency to be the first to touch everything is a shopping style that I prefer to avoid. However, when you accidentally find a dress that makes you feel full blown “Twiggy”, that is on final sale for $5.99, the defensive shopping atmosphere quickly becomes worth every elbow jab and the next thing you know you’re standing on the side of the road with knee high boots and your current favorite handbag (Michael Kors, anniversary gift) complimenting your latest discount find. Cheers, to next year’s Restaurant Week and all the irresistible bargains I am bound to discover before then. Social media is a crazy thing. Coming from the generation that has seen it all unfold from the beginnings of MySpace and Facebook, I am part of a dying breed, a breed that knew what life was like before the internet. With the development of social media came a variety of outlets to document our lives and share them with friends, family and even strangers. What started out as a platform for virtual networking has developed into a world of communities and subcultures, where people invest hours of time, sharing trades and self promoting. I can recall the transition stage when online networking, then a rookie form of communication, was becoming socially accepted. It was a time when asking someone if they had a MySpace came with blushing cheeks and a precursor of “I know this is lame to ask but…”. Fast forward just a little over a decade, now people swap screen names as casually as shaking hands. Like so many of my fellow peers, I have seen both the light and dark side of social media. I think by now quite a few of us have heard horror stories of Craigslist exchanges gone bad or witnessed relationships crumble from online interactions, stories showcasing the downfalls of misguided trust in strangers with internet access and cruel intentions. What you rarely hear about are the success stories. Recently, Ryan and I found ourselves guest starring in a success story of our own. 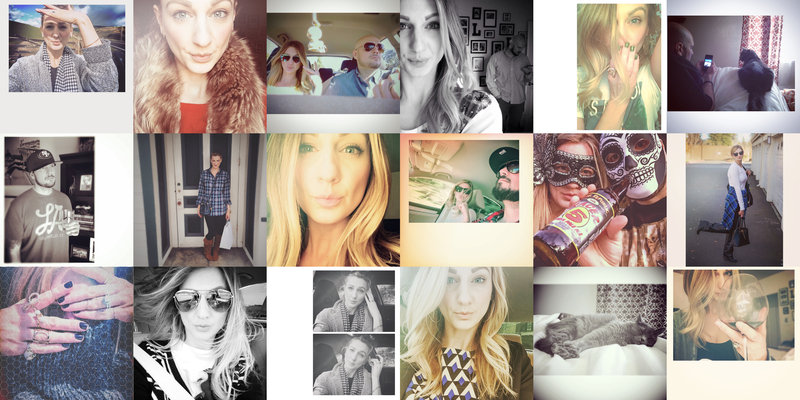 Instagram is my personal preference of all social media applications. It’s free of daily gripes and therapy seekers, like you find on Facebook. It has far less bicker and banter, like Twitter. 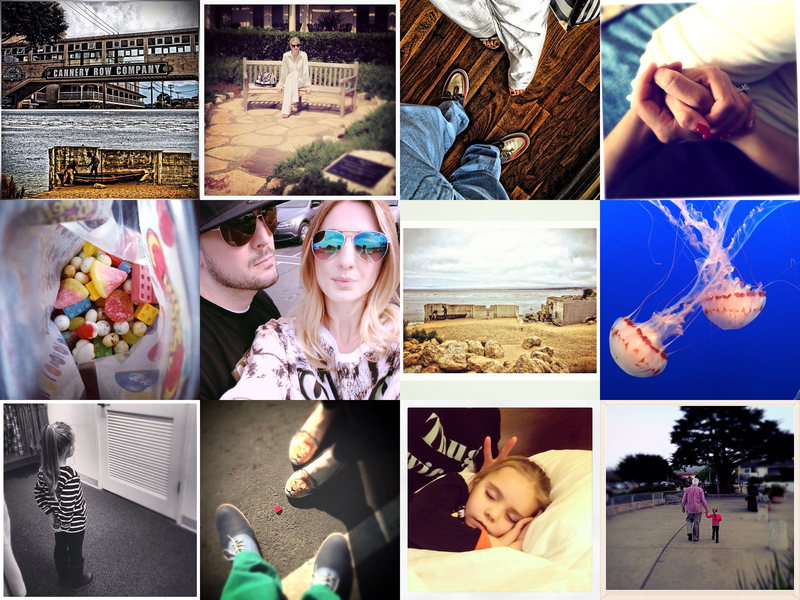 Instagram is designed to share images, photographs, art. 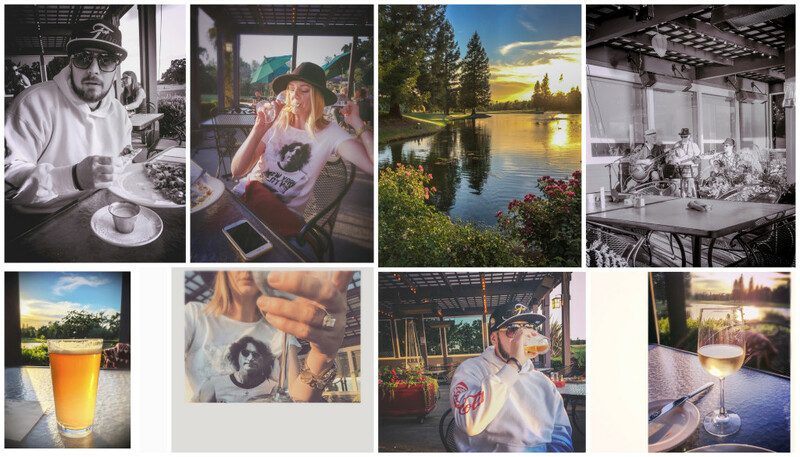 Through hashtags, images can be categorized to help other like-photos collect into filtered groups. 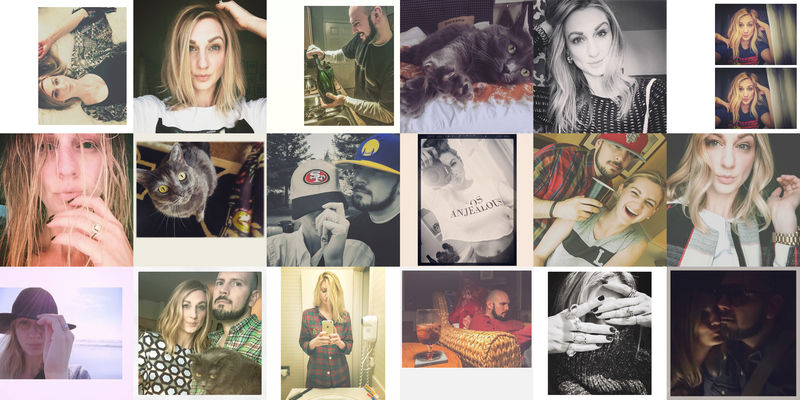 I have found tons of lesser known photographers full of inspiration and immense talent from scrolling through specific hashtags. 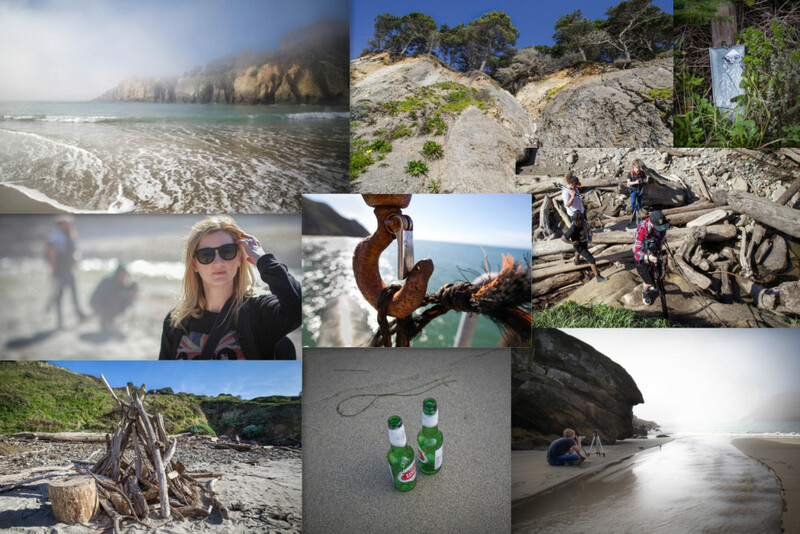 It was through a hashtag search that Ryan and I were linked with our newest friends, a group of guys on an epic journey, the Cali Coast Tour. On a trip that started at California’s border with Mexico and is headed all the way up to the border of Oregon, they are documenting, photographing and videoing the entire way. As they work their way north, Ryan and I, along with many others, have followed their tour through teasers they’ve shared online. Not long after they began, Ryan and I reached out in hopes of meeting up for a short tag along day once they entered the northern coast. We were envious of their freedom to follow a passion project and are curious in the outcome. Eight months in, they finally made it to the Sonoma Coast and our tag along request was approved. We were on our way for a day of serious unknowns. 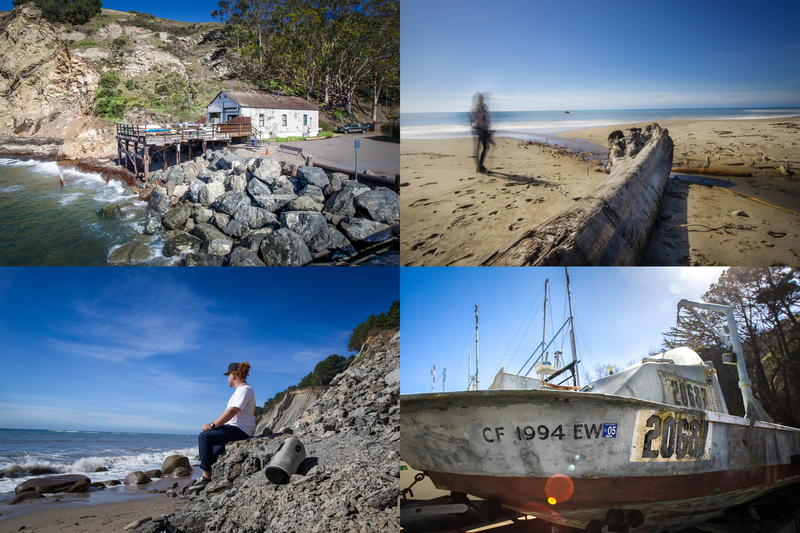 With backup plan in mind, just in case they ended up being less than stellar, we met up in Gualala, CA at Bones Road House BBQ for a day of beach hopping and coastal cruising. Not too long after breakfast, both sides were confidant that they would not need to engage their back up plans to escape the encounter and decided to mutually tackle the Saturday agenda. Several hours of driving, 3 beaches, 2 meals and 1 lack-luster sunset later, we were finished with dinner and back at the Bodega Harbor Inn for what turned out be a late night of swapping stories and sipping drinks. It’s rare in this day and age for people to be as authentic as you hope they will be. It is even more rare for the entire experience to be a genuine success. Fortunately, our day together was full of both rarities. To William, Tony and James, we thank you, for a day of memories including a flip-flopped ninja who lives under a pier, a shady walk to dinner through a hole in a fence and most importantly, for the pilgrimage onto unfamiliar beaches by way of rope climbing and creek jumping. We encourage you to complete your journey, finish your project and share it with all the supporters who have been patiently waiting. Oddly enough, my favorite shot I got all day was with my back to the beach and eye on a rock. Stump Beach Cove at Salt Point State Park, I dig you. 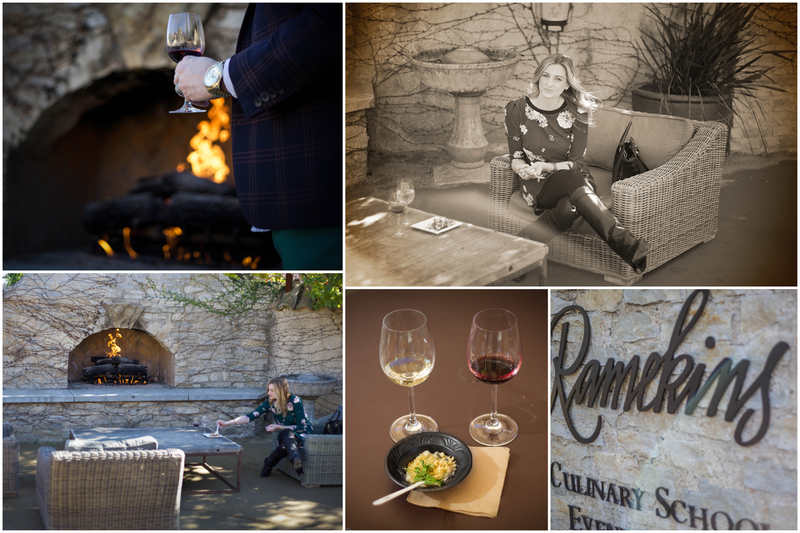 I don’t know a better way to follow up such a fulfilling day of photography and newfound friendship than a cheese conference held at the beautiful Ramekins Culinary School, Events and Inn in Sonoma, CA. Feeling rejuvenated from a night of ocean air, we made it home in time for a quick rest and change and then headed inland to the 12th Annual Sonoma Valley Artisan Cheese Conference. 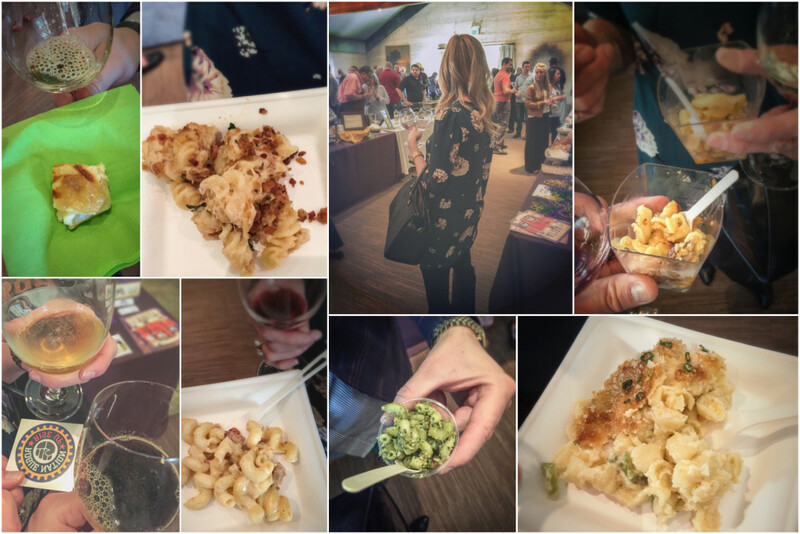 To be really honest, we had no idea what the Sonoma Valley Artisan Cheese Conference was. Having an email from your husband pop up mid-workday with two tickets to a cheese show has random written all over it. Having an unhealthy love for cheese and a unique ability to make the most out of any situation, it sounded like a mysterious land of good and plenty. I was immediately down for the cause. To finish off the afternoon, we joined a sit down, cheese and hard-cider pairing in the kitchen. A panel led by Tom Wark of The Cider Journal, walked us through the variations of tastings. Cider is still somewhat foreign in our household but with the knowledge and history gained I have become more open to stepping outside of my traditional beer or wine mindset. All the cider was supplied from local Sonoma County cideries. All but one cheese sample was locally sourced including my personal favorite, Tomme from Pug’s Leap Cheese. My top two favorite ciders were Tilted Shed’s Graviva and Devoto Orchards’ Cidre Noir. Taking a risk on a day up and down the coastline with a trio of guys we had never met turned out to be an irreplaceable twenty-four hours full of new stories and unexpected friendships. Taking a risk on an event that we had no idea what to expect from turned out to be a rewarding afternoon of sipping wine and eating mac and cheese, fireside. Cheers, to the rewards still left in the risks, to the good, still left in the unknown and to the journeys still left to be taken. 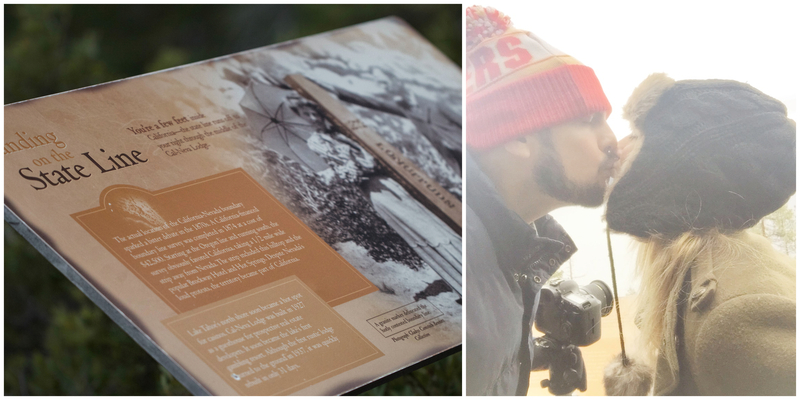 With a picture-perfect sunrise, cruise around the lake and evening photo walk under our belts, our South Lake Bucket List was practically complete. The remaining task had been taunting me through the bedroom window for the first half of our stay. Considering I have a healthy fear of heights and plummeting to my death, enclosed in an extremely tight place, hanging over a rocky snow covered mountain side, Heavenly Ski Resort’s gondola ride to the top of 10,000 ft. elevation made me nervous in a “throw up my breakfast, who am I kidding, I can’t eat breakfast” sort of way. Our Saturday afternoon fate was inevitable but, until then, the days activities were calling. After reaping the benefits of our free breakfast coupons, hotel lobby coffee fueled and optimistic to catch some native wildlife in its natural habitat, we headed back to the sunrise location from the day before. Capturing a bald eagle in the wild is my husband’s photographic unicorn. 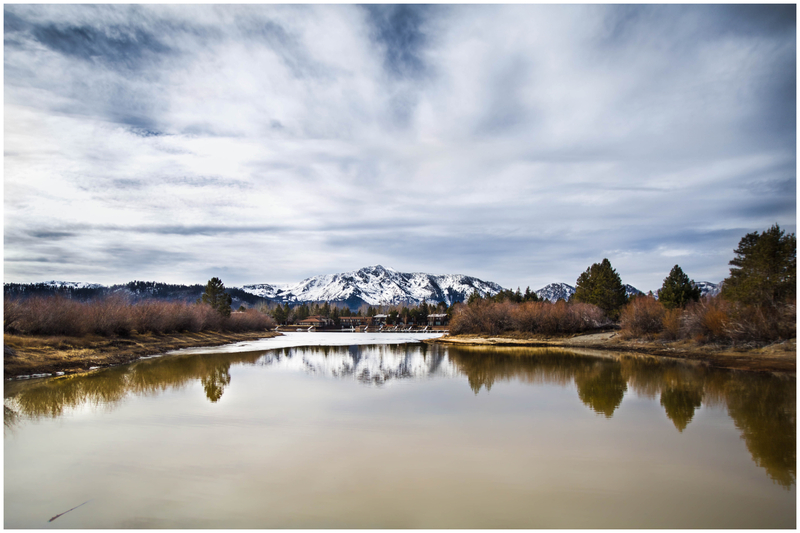 Tahoe, perched high in the Seirra Nevada Mountains, is a prime location to search for our nation’s bird. Setting a goal to find an eagle, we headed back to our pervious mornings location where we had seen multiple signs listing the bald eagle as one of the many birds inhabiting the area. With cameras in hand, tripod on back and enough faux fur accents to make a blanket, we trekked out to the lakeshore through the Tahoe Keys Marina. The popularity of the trail, that runs along where we had cut through the brush to set up our sunrise shot, led us quick to conclude that the likelihood of seeing an eagle was slim to none but, the grand sweeping landscape kept us intrigued to move forward. Eventually, the trail faded into an opening and we were out of the trees. The lake was close ahead and the mountain-lined horizon was far behind. 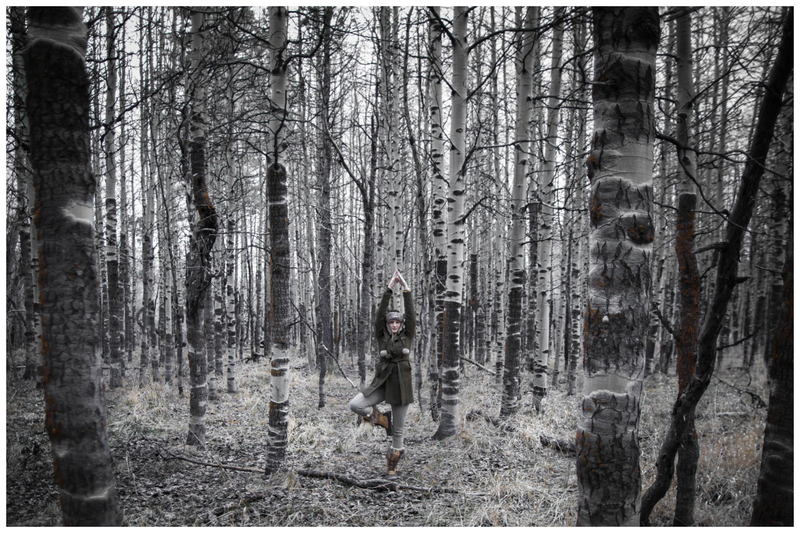 The landscape was almost desert-like, no vegetation, no wildlife and minimal streams, all somewhat frozen over. Was the view we stumbled into worth not capturing an eagle? Probably, not. Did it produce some of my top favorite shots I got the entire weekend? Absolutely. As early afternoon crept up, the gondola became more tangible, more real. Knowing that at some point the ride would stop running, we bucked up and headed over to check off our last “to do”. Boarding the plexi-glass pod, I knew we were up for some sort of adventure. Being one of the only humans to ever visit Tahoe that does not ski, snowboard or do any sort of extreme winter sport, I had no idea what I was really in for. Ryan, being someone who had never been up the mountain, expected just about the same level of amazement as I did, less the blatant fear of heights. We both anticipated a great view and maybe some free hot chocolate with proof of purchase. The words to explain the feeling of my first gondola ride are difficult to find. Suspended above the side of a snow-capped mountain, with the hotel you were moments ago safely seated inside shrinking out of sight, as the view of the lake becomes bigger until you can see more water than civilization, all combined with the realization that you are a mere windowed bucket hanging by a bracket on the largest pulley system imaginable, removes any security you once had in life. Looking head-turned mountain side felt like drifting uphill within an arms reach from bear-tracked snow. Looking head-turned South Lake side, made you overtly aware of how far in the sky you were traveling, blindly, backwards, uphill. Granted, thousands of people travel by way of gondola to the top of the ski resort yearly, including employees twice a day, with minimal hesitation. I know many snow sport enthusiasts would go as far as rolling their eyes at my dramatic rendition of personal experience. However, for someone who rarely climbs much past the third rung on a ladder and panicked on the people-mover at the Santa Cruz boardwalk, which hangs at a fraction of the elevation, mastering the courage and following through in this case was a personal accomplishment on a very huge scale of personal accomplishments. After circling the vista point at stop one, we were confused by the fact that there was no “down the mountain” loading zone. I didn’t see anyway that there was more “up” to go, feeling that we had already reached the top of the world. When the attendant managing the on/off deck informed us we were going to be just in time for happy hour we thought for sure he was joking. He put us back in a basket and moments later we had come to the end of the 2.4 mile ride. Pulling into a platform and walking out onto snow, 10,067 ft. above sea level, an entire hidden village built to party and ski laid before us. 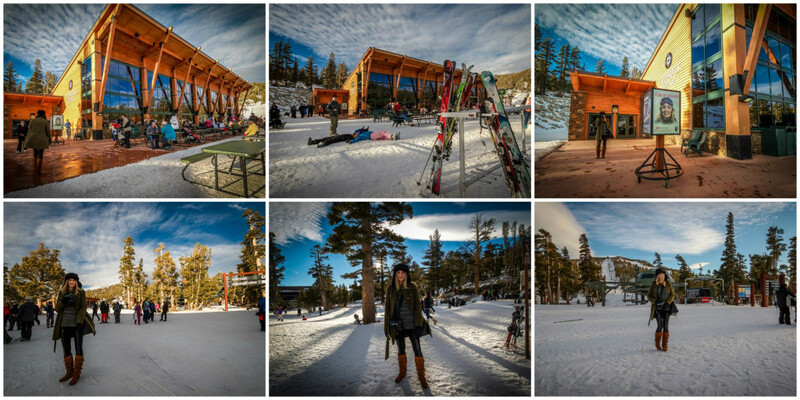 I quickly discovered what all the hype about a ski lodge is. Working my way through the crowd, I passed the go-go dancers and walked up to the bar, sure enough, in time for happy hour. Other than being snubbed by multiple bartenders, clearly not knowing the secret “I need a beer” code and waiting fifteen minutes to be helped, the bar was delightful. Beers in hand, we exited the warmth of the lodge and hit the outside party. We sat in the middle of freezing cold strangers, everyone from obvious athletes, clad in their down stuffed jackets, walking with a sort of swagger that only a regular can adopt, to people who were even less prepared to be walking on tightly packed snow than we were. That includes a woman in wedged boots that looked like she was about to break her knee caps in an effort to stand upright. Some of the most unique people watching I have ever done. Feeling triumph in our feat, by the time we made it back to earth we had worked up an appetite for hot food and taste for beer. Stateline Brewery and Restaurant, located underground beneath The Shops at Heavenly Village, offered everything we were looking for. In an atmosphere reminiscent of a huge basement party, we were seated at a corner table in the middle of the room (figure that one out) and immediately ordered beer and artichoke dip before even seeing the menu. Breweries almost always have artichoke dip so it felt like a safe bet. When the waiter brought out a loaf of bread, sliced and hollowed on one side, with artichoke dip served somewhat bread bowl style, we didn’t know what to do. The presentation was a first for us but it didn’t take long for Babe to take the initiative, slice, dice and dip. I never want to eat artichoke dip any other way for as long as I live. Indulging in the local brewed beer selection, as usual, I went for the lighter option, White-Out Wit and Ryan went for the Acclimator IPA. Ryan absolutely loved his choice and I didn’t hate mine. Before I get to the entrees, I have to add a quick Noodle Note: Due to the back up in the kitchen and our wait for our main entrees exceeding a half hour, we received a complimentary order of potato chips. Something I would normally overlook on a menu, their potato chips were handmade, fresh cut, drizzled in some sort of sweet yet hearty sauce and served warm. They were literally the best thing we had tasted the entire trip. I have no picture to share because, we killed them. For anyone that knows me, or has ever read any of my previous reviews, they know that when I go to a brewery for the first time I have to try one thing first, Fish n Chips. 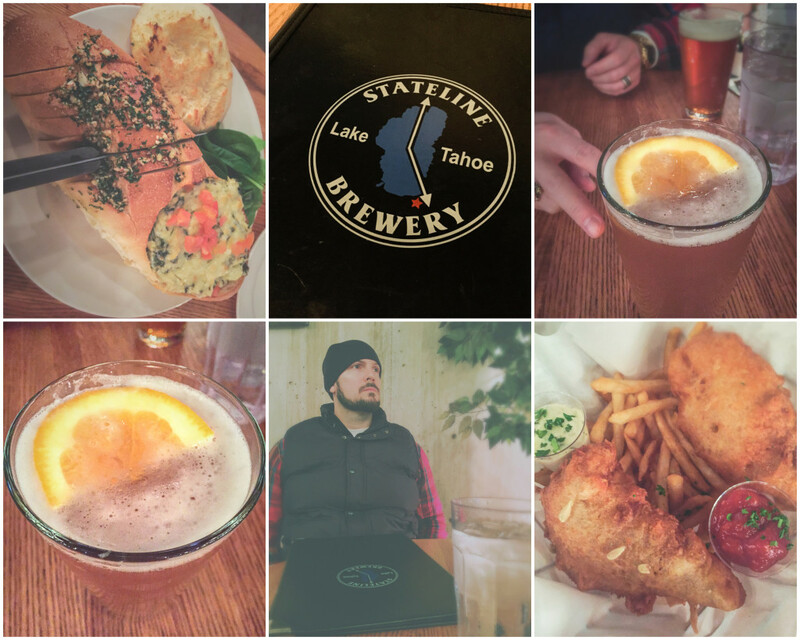 Stateline’s fish and chips were classic beer-battered Atlantic cod and perfectly crisped fries. Babe had the nachos, his own brewery classic, which were smothered in queso (his favorite word) and good enough to keep picking at even after we were knowingly full. Thanks to our sufficient brewery fix and the past days festivities, we walked out of Stateline content and ready to call our last night good. No matter how long we stay somewhere, or how ready we are to get home, saying good-bye is always the worst part. This trip was no different. The amount of memories we managed to create in just three days was unreal. With life being so busy and so focused on work and Ryan’s schooling, the time spent reconnecting and having absolutely no one but each other to focus on was long overdue. Tahoe, will now, officially forever hold a piece of me and will be somewhere to visit regularly for the length of our existence. We have already planned our next trip back and I have threatened a total of 24 times to get in the car right now just to go have Azul’s nachos and head back home. Don’t tempt me. I’ll do it. The last time I visited Tahoe I still wore puff paint, I had the fading hint of a perm and my stay was spent on a ridiculously too big to be called a boat, boat with grown ups and my very best good childhood friend. My strongest memories from that trip were how insanely pure the lake was, even at it’s deepest, and traveling to the shore of Emerald Bay on a slowly leaking dingy, half way sunk by the time our feet met the ground. It’s ranked in the top three best trips of my adolescent career. Prior to that, I have a handful of recollections from snow centered trips where everything was white and the houses all seemed to be carved from the same tree. For a very delayed celebration of our third wedding anniversary, we decided to vacation in the place we both have made multiple broken promises to visit since we’ve been married and neither of us have been to in at least a decade. 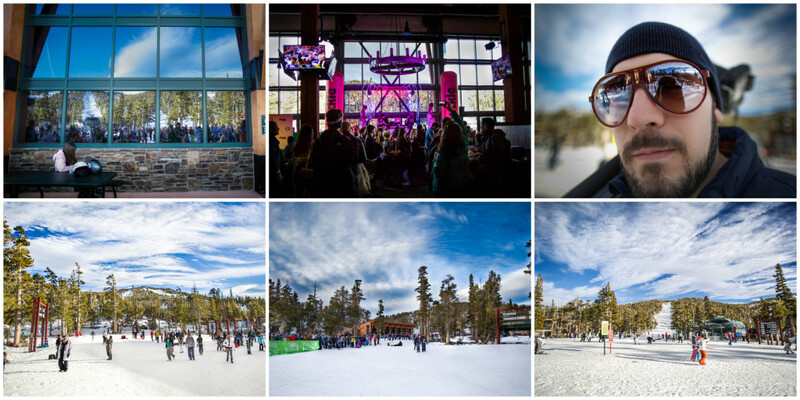 Now, I can honestly attest that South Lake Tahoe is a completely different experience as an adult than it is as a pre-teen. 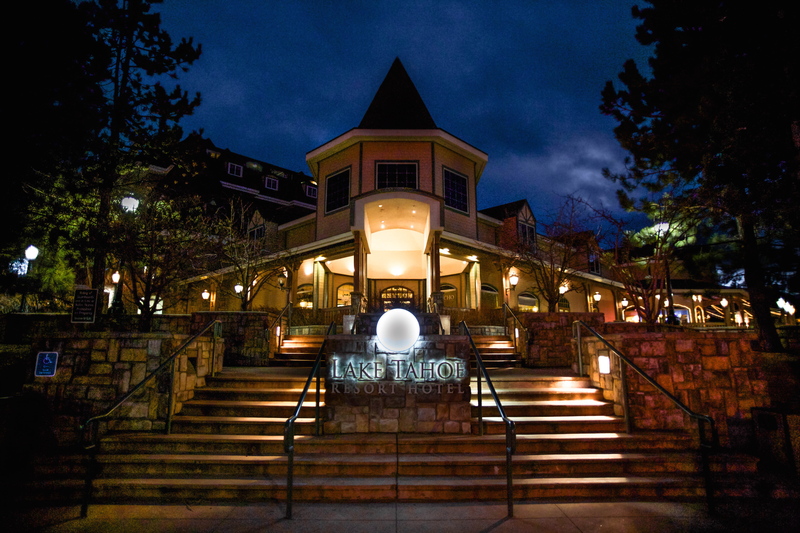 We arrived at our new temporary residence, Lake Tahoe Resort Hotel, placed a tip toe away from the California/Nevada state line. The novelty of being able to literally jump from state to state throughout the following four days never lost it’s comicality. The hotel was, almost obviously, a freshly repurchased and rejuvenated, former Embassy Suites, complete with koi pond and glass elevators. With warm happy faces (mountain people are always so friendly) we were greeted and sent up to our roomy suite with a bedroom view of the gondola ride at Heavenly ski resort. Ryan mentioned something about the undeniable feeling of excitement that ensues after checking into a new hotel, but I was too busy pointing out how many sinks we had and lining my shoes up by height to hear him. Five minutes after check-in and we were in search of dinner, that’s when things got really, real. Azul Latin Kitchen is a relatively new restaurant located at the opposite end of Heavenly Village than our hotel was. As self described, from their website, Azul offers a “lighter, fresher and healthier take on Mexican and South and Central American cuisine”. The menu is full of braised, roasted and slow cooked meats, garnished with tropical fruit and paired with margaritas sized for giants. I fell into a frenzy as soon as I saw the bar, created out of stacked nightstands and colored lightening. Brilliant. In classic Ryan fashion, my noodle had a burrito, full of Achiote Coconut Pork and queso, while I went for the three taco combo and selected what I hoped to be a well rounded presentation of all the flavors the Latin kitchen produced. Coconut Pork, Ancho Mole Chicken and Crispy Fish tacos, did exactly that. Although there was not a bad taco on the plate, the coconut pork was so good I have been talking about it ever since we got home, six days ago. Served the pitcher size Hibiscus Margarita from the two Stephanie’s, waitress and waitress in training, true love was in the air as we both fell madly head over heels with Azul, Heavenly and Tahoe all at once. 5:45 in the morning came quick. We both flew out of bed at the first sound of the alarm clock, running on pure adrenaline, to catch a Tahoe sunrise. Heading out blindly, in search of somewhere reachable before sun break and close to the water, we Google mapped our way to the Tahoe Keys Marina. On the map, it appeared to dead end exactly where we wanted to be. However, after parking, the reality of how long of a walk out to the lake it was from our current location surfaced. So, we opted on fence hopping and settling on a closer view of the mountains, substituting a creek for the lake. 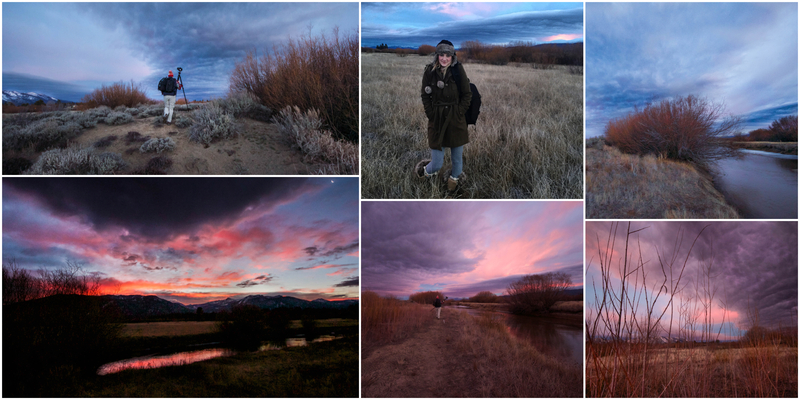 Enduring freezing cold temperatures, layered in half the winter clothes we own, with dualing cameras aimed and ready we watched the sun climb up over the mountains and turn the entire sky into every shade of pink you can imagine. It felt like we were the only people for miles witnessing the birth of a new day. The drama was surreal. Once the sunrise settled we were on a mission of no turning back. 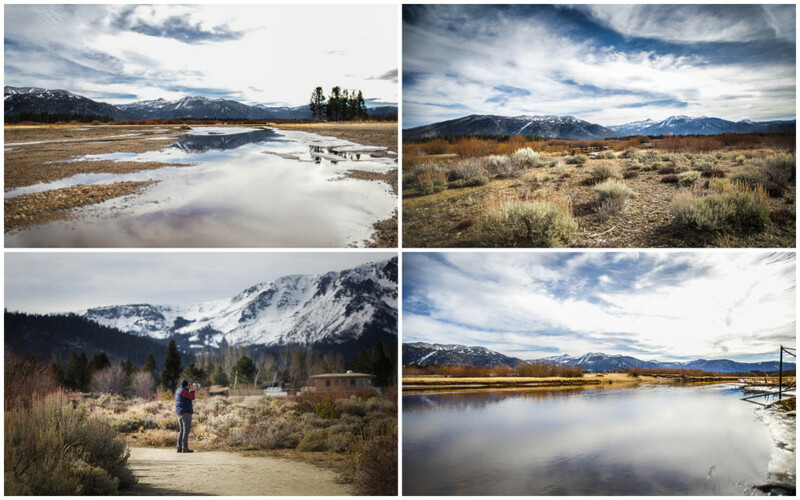 Packing up and continuing out around the lake, our next stop was Emerald Bay for a brief scenic pull over. 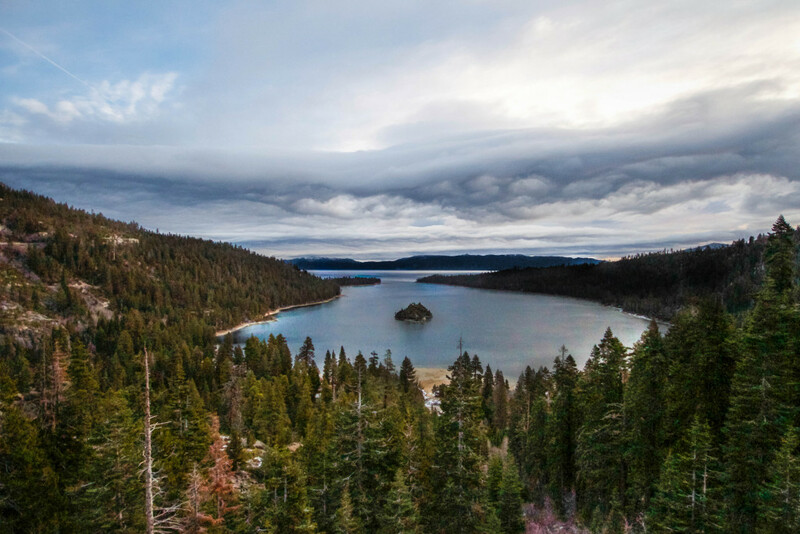 No matter the sun position, weather or angle, Emerald Bay sustains it’s reputation as one of nature’s most impressive gifts. Back on our way, our next destination was the state line lookout in Incline Village. The hike is short but with the elevation and incline, I turned my speed down to a mosey about half way up and used the ole “photo op” line to catch my breath. At just under 7000 ft. elevation, my wine country, practically sea level, lungs could not get acclimated fast enough to catch up to my feet. After a long twenty minutes, finally reaching our goal point, feeling as clever as ever, we each took a state and stole a kiss over the line. I stood California, he stood Nevada. Playing in the minimal patches of snow, still left from the heavy weather that had just passed, we ran around like kids who had never experienced frozen water and absorbed the landscape. At that point in my life, it was the closest I had been to standing on top of the world. That changed by Saturday, but for the time being, I was captivated. The lake looked like it had a thin layer of glitter floating on top and, despite a haze creeping in, the sky felt crisp and clear. The moment was so encapsulating, it almost overshadowed my first time wearing snow boots. Almost. Although the saturated colors and clusters of sunlight were present that morning, Babe’s artistic rendering of what we witnessed from the top of the rock, with almost an Ansel Adams gothic undertone, is too emotionally invoking not to share. Upon completion of our self guided tour, ending exactly where we began, we found ourselves sitting in an empty restaurant in our hotel lobby drinking beer and eating pizza before noon. Being up before the sun gave us ample time to accomplish a great deal by the time most of our fellow patrons where digesting breakfast. The birth of “I don’t always drink beer for brunch, but when I do, I do it in an empty restaurant” was born. 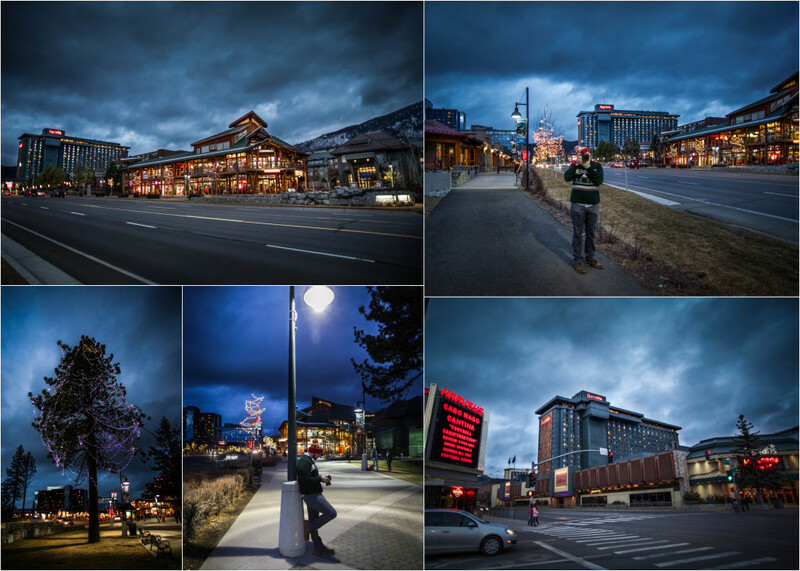 Due to our first dinner in South Lake being so successfully delightful and in the need of an energizer pick-up from our ongoing day, we photo walked our way down South Lake Tahoe Blvd., catching as much of the dusk settling in as we could. After contemplating our options, we eventually planted ourselves right back down at our exact same table at Azul for dinner number two. This time, to fulfill my already developed craving for coconut milk braised pork, Noodle and I shared nachos and split an order of the Chorizo Empenadas. I can’t even look at the picture of the nachos, it makes me so sad that I don’t have them at my everyday disposal. 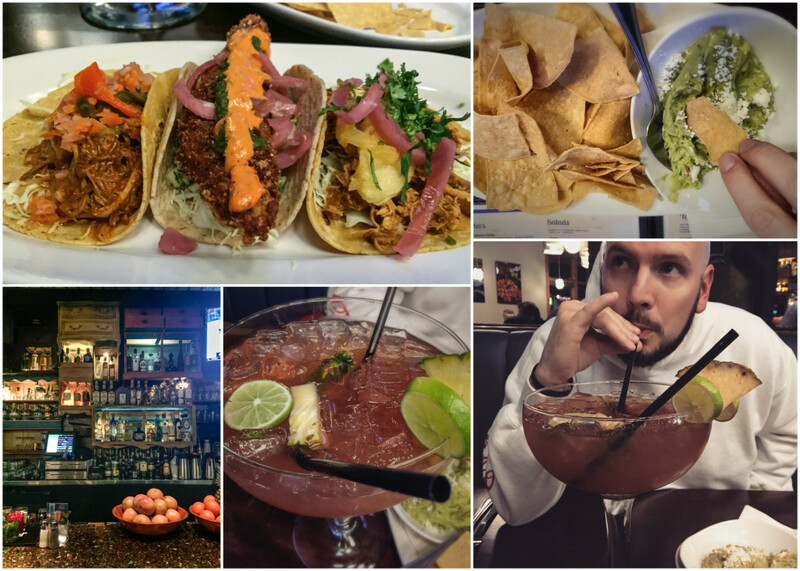 Naturally, we went for another margarita pitcher. The walk to dinner was the experience of the day. The short skyline of South Lake Tahoe, with it’s white capped mountain backdrop, Heavenly’s gondola running up the middle, makes a person feel like they have found some pocketed town in the middle of the Sierra Nevada’s that no one knows about. Regardless of the boulevard being full of snowboarders, skiers, neon lit, jam-packed casinos and herds of tourist, in an odd unexplainable way it still feels very remote and hidden. While one side of the street has a constant rush of snow goers coming and going from the mouth of the gondola, the only way up and down the mountain during this time of year, the other side feels almost like a sunken observation deck, allowing passerby’s to stand street level, looking up at the rush of stop light controled traffic. It’s hard to say which side would be my preference. The energy of the bustle is magnetic but the disconnect and slower pace on the other side is much more relaxing. They both gave great face, so to speak. As always, Ryan got some shots that have left me envious. We have two completely different eyes and methods of editing and I am often replying to his work with “why didn’t I think of that.” These 2 from our evening on the strip left me envious of 2 elements; 1.) the color he was able to pull out of his sky and 2.) the idea to play on natural contrast with intentional gradient, giving a modern black and white a little age to it. I am forever a sucker for a strong black and white. We had every intention of hitting sunrise again the next morning. We displayed those good intentions on Friday evening with in room cocktails and a jump on our photo editing, our version of an early night. We pushed that intention by making a point to be in bed before eleven. Come Saturday morning, we kissed that intention good-bye and told it to have a lovely day without us as we opted for extra sleep instead. Better luck next time. Day two in the books. Up next, braving the gondola. Some of the best nights we have had are nights that start out with minimal to no direction. Home after work on our Friday, last week, we knew we had a very important appointment to watch our niece in a preschool concert. It was the only solidified plan for the night and even it lacked a lot of direction. (Thank heavens for Google and my aunt like intuition or we would still be looking for the gymnasium.) Once inside, it took a second to realize that we were being seated for a delayed Christmas concert consisting of 8 songs, sung by about 40 children, all around the age of 4. It was as adorable as you would imagine. The lack of synchronization in choreography (which was mostly clapping and hand gestures), the upside down or backwards props, the kid on the end that refused to do anything but stand silently through the entire performance in protest, all of them innocently oblivious, made the half hour long program one of the best live performances I have ever seen. Her bravery in standing for eight songs in front of a room of strange faces made us proud. Her dramatic rendition of each song, sung on her tippy toes straight into the ceiling mic, while solo bowing as she saw fit, blowing kisses to her fans (us) and even adding some of her own choreography, made us extra proud. Comfortable on stage much? Her face when she saw Ryan and I was priceless. It’s amazing how hungry and in need of a cocktail you can be after sitting through a preschool choir Christmas concert, three weeks after Christmas. Finding ourselves in the middle of the extremely quaint Windsor Town Green, Ryan’s gut instinct drove us to Kin, a relatively new edition to the area (established in 2011). Seeing a line waiting outside the door prompted a call to check the wait time, which, only being fifteen minutes, was probably doable, but our stomachs had lost their patience. Some other time when we are less starved, for sure. Swiftly, Ryan headed one street over onto Windsor River Road and pulled right up to the front of Chinois Asian Bistro. This proved to be one of the best decisions we have ever made, at least in Windsor. It had been awhile since Ryan had been there and it was my first. I was immediately calmed by the ambiance. The dark woods, red drum shades hanging from the ceiling and friendly faces greeting us at the door, had me at “hello”. Seated and served by one of the best waitresses I have ever experienced in Sonoma County, so much so it was refreshing, I jumped at the chance to order a Red Door, a soju and sake cocktail. It was the first thing on the menu and I just went with it. You can imagine my appeasement when I discovered that it was not only fruity and refreshing, without being too sweet, but served with no ice, no need to waste the space if you ask me. We started with the Ahi Tuna Tar Tar, perfection, and an order of the Coconut Prawns served with a pineapple dipping sauce that I would eat with a spoon. In classic Noodle fashion, for our main event, we both ordered Chicken Pad Thai. I have been unable to find anywhere that will make Pad Thai without peanuts and to a spice level of my specification (I’m about a 7 on a 1 to 10 scale of spiciness) since I lived in Orange County years ago. Already feeling spoiled with my iceless Red Door, pineapple sauce liquid gold and Tar Tar filled belly, when the waitress told me the Pad Thai could be made peanut free, I almost hugged her. It had been a long day. I am usually not so emotional about my noodles. Taking most of our main course home, I can attest that it is just as good reheated about four hours later as it is fresh from the kitchen. Next time, dessert. The transition between December and January is always bittersweet. Waiting all year for Thanksgiving to kick off the holiday season and take us into December can be agonizing. It’s confusing to even myself why I love December so much. A lot of things that occur in December happen during the rest of the year, good food, parties, family, overall merriment, all can be found spread throughout the prior eleven months. Further more, some of the things that are holiday specific and December sensitive are down right undesirable . The non-stop on-the-go going, crowded shopping, endless schmoozing, parking lot road rage, pulling all the decorations out, putting them all back, it’s simply a lot of work. Like many people, I have found myself standing twenty people deep in line at Target holding a talking doll from a cast of characters I am too old to recognize, asking myself, why do I do this? As soon as I see something themed in red and green with a hint of tinsel or white fur, or see someone dropping off gifts at the toy drive for others less fortunate, or smell something laced in cinnamon and spice and stuff that’s nice, the answer is so simple. The feeling. I crave the feeling of Christmas. It’s the feeling that makes all the motions worth it. My first Christmas memory is the year Santa brought me a child size, white, wooden table and chair set. Leave it to me to be a four year old over joyed to get furniture. My dad in his horribly 80s, navy blue, velour robe and my mom sitting camera ready by the fireplace is a Christmas memory that is most likely reminiscent of thousands others but uniquely special being self specific. That moment felt like pure magic. 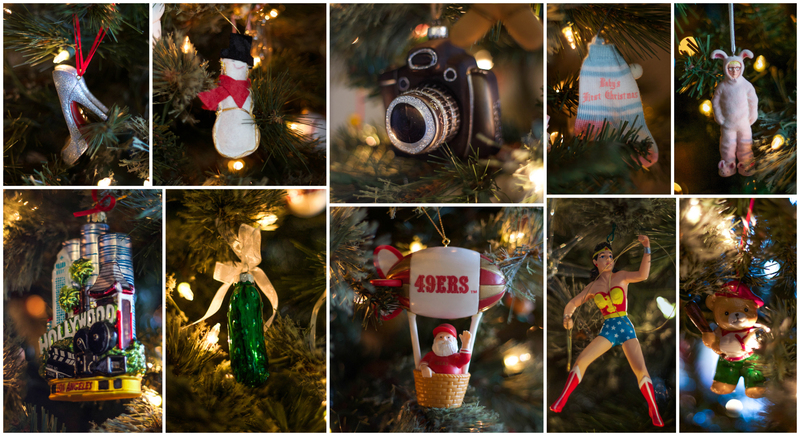 Now, as a thirty something year old, I make my own Christmas magic. As soon as Thanksgiving clears, the cheer spreading starts. I knock out the bulk of the madness in a single day and spend the rest of the month adding “finishing touches”. 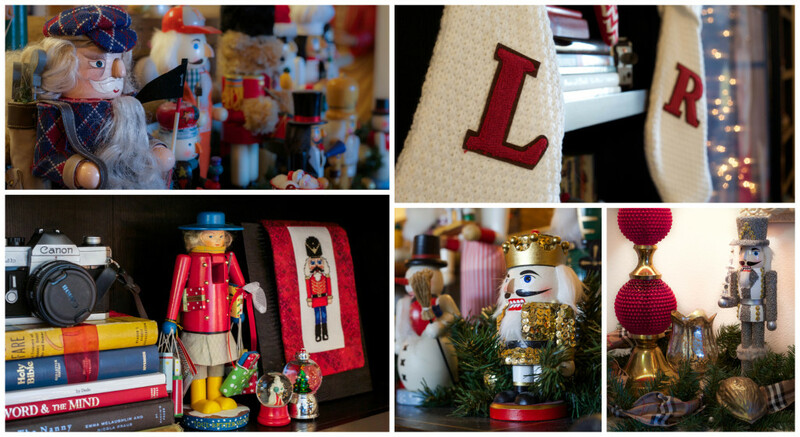 Over twenty-five years of Nutcracker collecting, ornaments dating as far back as Baby’s First Christmas, garland and gold, plaid and bows, I even have a complete action figure set of the cast of A Christmas Story. I’ve got a serious problem. I blame my mother. It’s undeniable that my top favorite component of Christmas is seeing my family. The prospect of having my entire family in one room at the same time has led to extreme loss of sleep, every single Christmas Eve, my whole entire life. My Grandma and I would lay awake for hours the night before Christmas, both of us too excited to sleep. This year, having to be the first to leave our family affair, I became overly emotional as soon as the hype of good-byes settled and I was sitting calmly in the car. A day ran on an endorphin fueled high had crashed. The crash brought an overwhelming sense of missing. I miss the days when life wasn’t pulled in so many directions, when we were all young and we had no choice but to spend weekends together, when we didn’t have to spend the only holiday we have together catching up like strangers at a reunion. I miss my family and there is no way we are leaving early next year. Noodle Note: Entering a new year gives way for us to renew our optimism, restore our motivation and reevaluate our direction. It can feel like the rebirth of hope, even during a time when hope seems to have been sucked out of the world and replaced with anger and fear. Our hope is for everyone to experience a positive 2015, engulfed in humanity and resolutions for a better tomorrow. In our house we have deemed this the year of action. Last year was the year of mapping, as we sculpted out the road we know we need to take to become better, stronger and healthier version of ourselves. This year, we make moves. 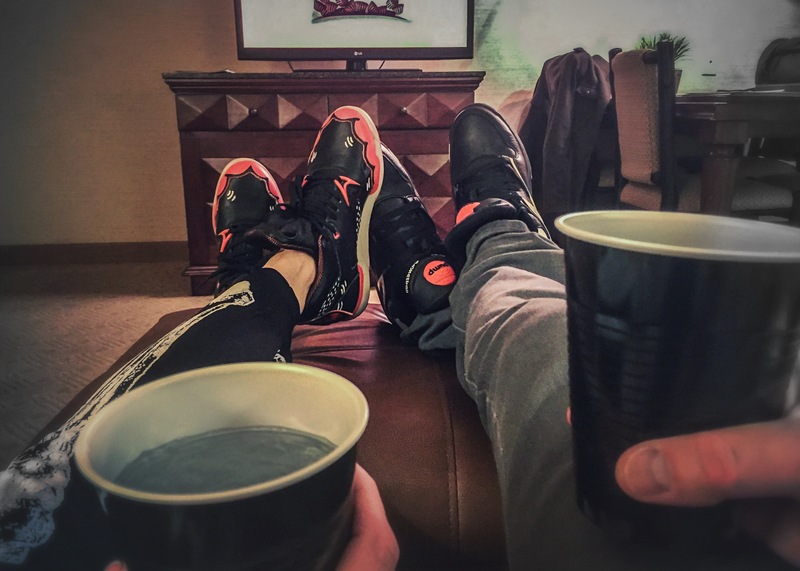 Cheers 2015, we are ready for you.